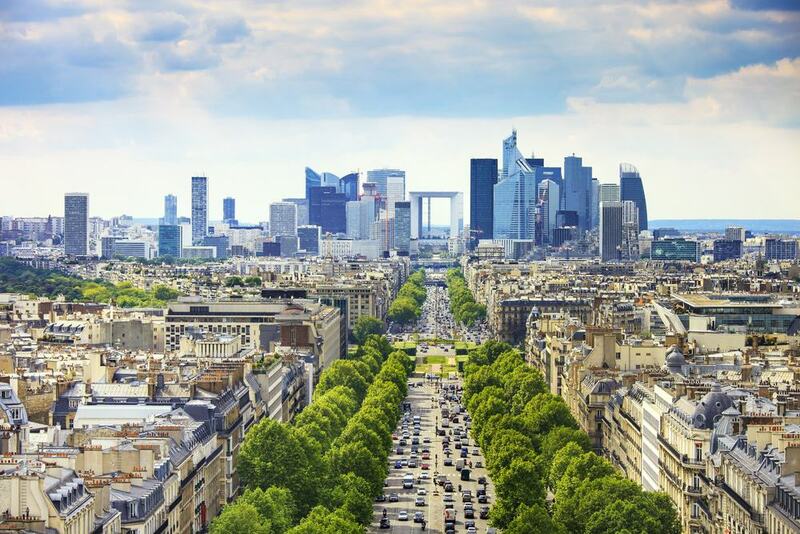 Even if you’ve never been to Paris you may feel like you already know the City of Light. And in most cities in the world you’d be scraping the barrel trying to find 75 genuinely worthwhile things to do. But that will never be the case in Paris. Such is the amount of world-beating museums and sights we all know and love, there will never be a shortage of ideas. We reckon you could make another 75 with the rejects and still have the time of your life in Paris. You can’t compose a list like this without having tried and trusted favourites like the Louvre or the Eiffel Tower, but we also have a few recherché places and experiences that merit the extra minutes on the RER or Métro. The world’s largest and most visited art museum has more than enough material for an article of its own. 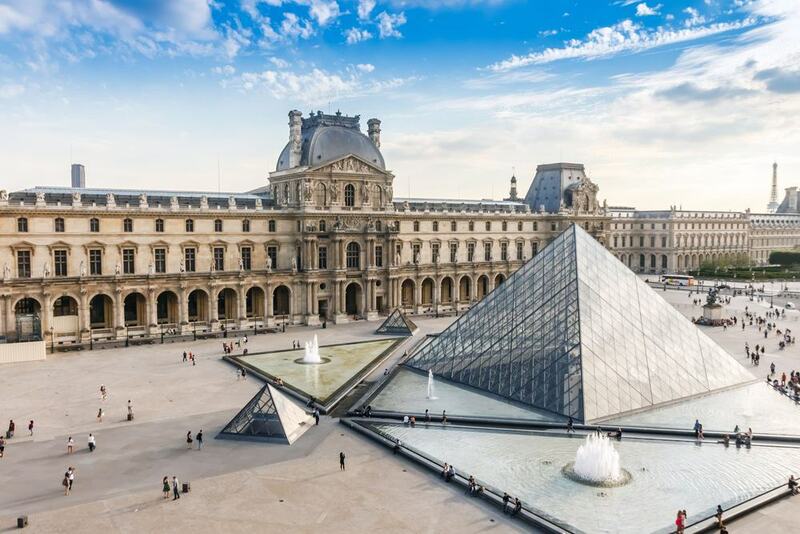 The Louvre Palace started out as a medieval fortress, before becoming a gallery for artists to study antiquities and the works of Old Masters in the 1700s. Fast forward 230 years and you have a museum that you’d need weeks to fully appreciate. There are antiquities from scores of world cultures and a collection of Renaissance and Baroque art that puts every other museum in the world to shame. If you are pressed for time, see the crème de la crème like the 2,200-year-old Winged Victory of Samothrace, Liberty Leading the People (Delacroix), the Portrait of François I (Jean Clouet), the enigmatic Gabrielle d’Estrées and one of her sisters (Unknown) and of course the Mona Lisa (Leonardo da Vinci). In the astonishing confines of a Beaux-Arts railway station is a compendium of French art and culture from the mid-19th century to 1914. 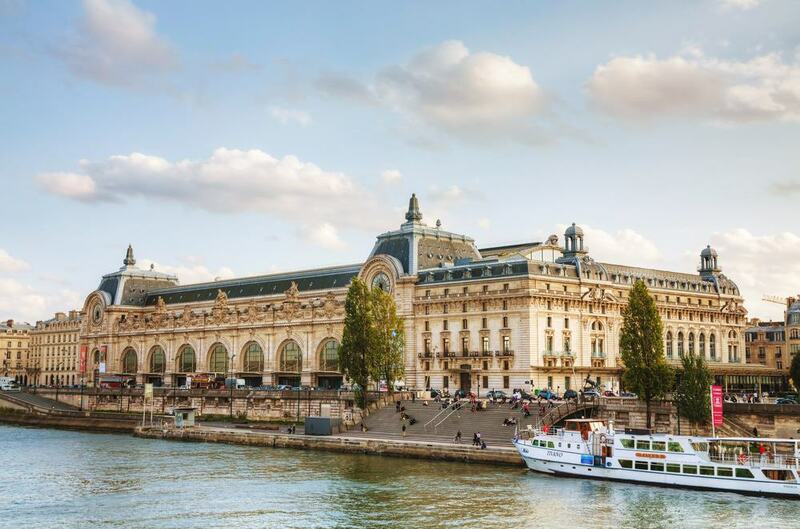 The Gare d’Orsay is on the left bank of the Seine and was completed in 1900 for the Exposition Universelle. After becoming obsolete for modern rail travel the building sat idle before being listed and turned into one of the largest art museums in the world, filling the gap between the Louvre and the National Museum of Modern Art at the Pompidou Centre. In this unforgettable environment are scores of iconic works of art by Impressionists and Post-Impressionists like Renoir (Bal du Moulin de la Galette), Cézanne (The Card Players and Apples and Oranges), van Gogh (Starry Night Over the Rhône) and Manet (Le Déjeuner sur l’Herbe). Even taking on board the queues and safety measures, how could you possibly come to Paris and not go up one of the world’s most famous landmarks? Built in time for the 1889 World’s Fair, the tower stands at 324 metres and was the tallest structure in the country until the Millau Viaduct was completed in 2004. As an attraction it hardly needs introduction. If you’re in the city for the first time then it needs to be a priority, but if you’re returning after a few years you can spot the city’s new landmarks, like the Fondation Louis Vuitton, from the observation decks. Close to 7 million people ascend the Eiffel Tower every year; most go up to the first two levels where there are shops and restaurants, while the third level is still the highest accessible observation deck in Europe at 276 metres. 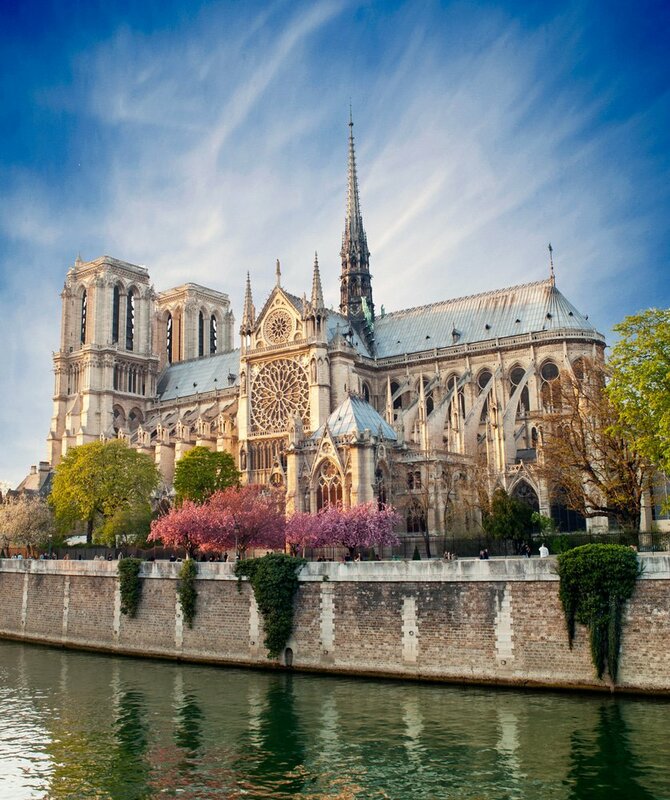 Hands-down the most famous and beloved Gothic monument in the world, the Notre-Dame’s unmistakeable towers rise from the eastern point of the Île de la Cité in the Seine. In Paris’s Medieval core, the cathedral was begun in 1163 and completed just under 200 years later. After picking up damage in the Revolution this monument was revitalised in the 19th century by the master restorer Viollet-le-Duc. There are many reasons to brave the crowds and see the Notre-Dame, from the peerless sculpture on the facades (including the famous gargoyles), to the rose windows, stained glass, bell (enshrined in literature by Victor Hugo) and the view that can be had from its towers. Despite the Revolution the treasury still has relics like the Crown of Thorns, while you can peer into Paris’s distant past in the excavations at the Archaeological Crypt. The largest and maybe the most famous palace in the world isn’t something to take lightly. A testament to the opulence and excess of the ancient régime, Versailles grew from a hunting lodge in the 17th century to the ultimate statement of power in the century that followed. 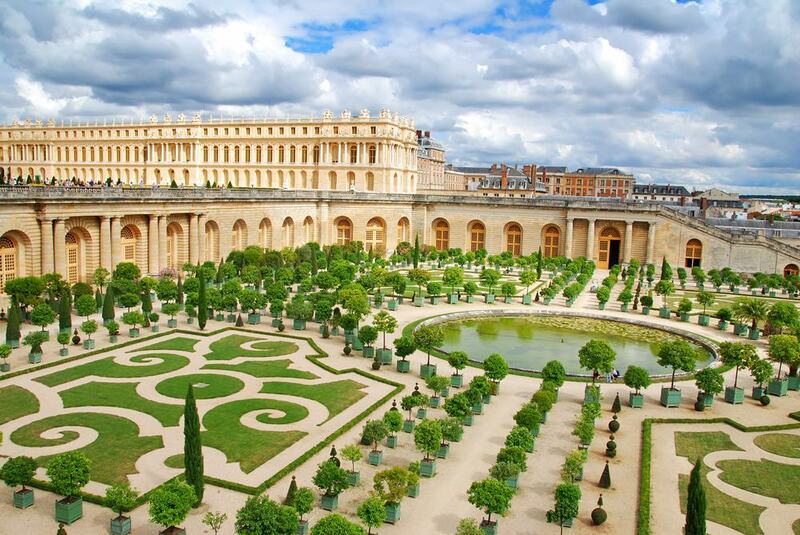 André Le Nôtre, who perfected the French formal garden style, and the virtuoso artist and decorator Charles Le Brun are just two of the masters to leave their mark at Versailles. You need a lot of time to get the most from the palace, its opulent apartments and the historic Hall of Mirrors that links them. And the main palace is only one element, along with the bewilderingly large grounds, the Royal Opera House, Grand Canal, Neptune Basin, Grand and Petit Trianon, and not to forget Marie Antoinette’s own idyllic village, the Hameau de la Reine. 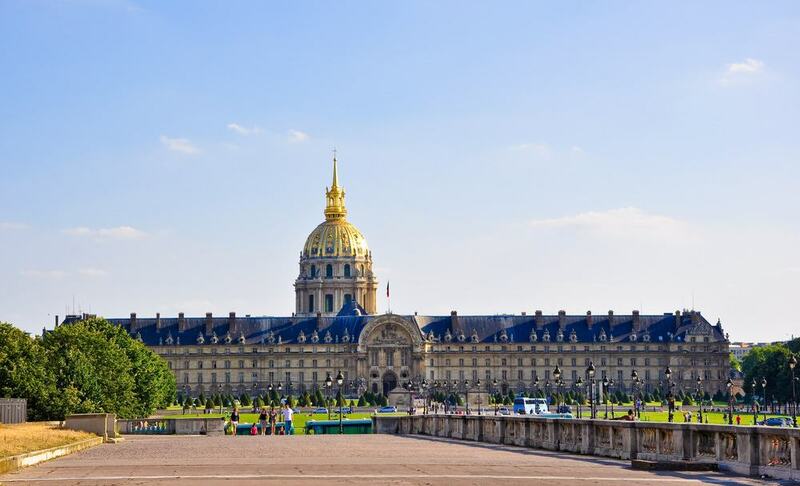 Louis XIV founded the sumptuous Hôtel des Invalides in 1670 to house destitute and infirmed war veterans. The building still fills that purpose, as a retirement home for servicemen and women, equipped with medical facilities. For the military-minded or people enthused by French history there are also museums with martial themes inside. One, the Musée des Plans, has tactical scale models of cities, designed for military commanders in the 17th, 18th and 19th centuries. 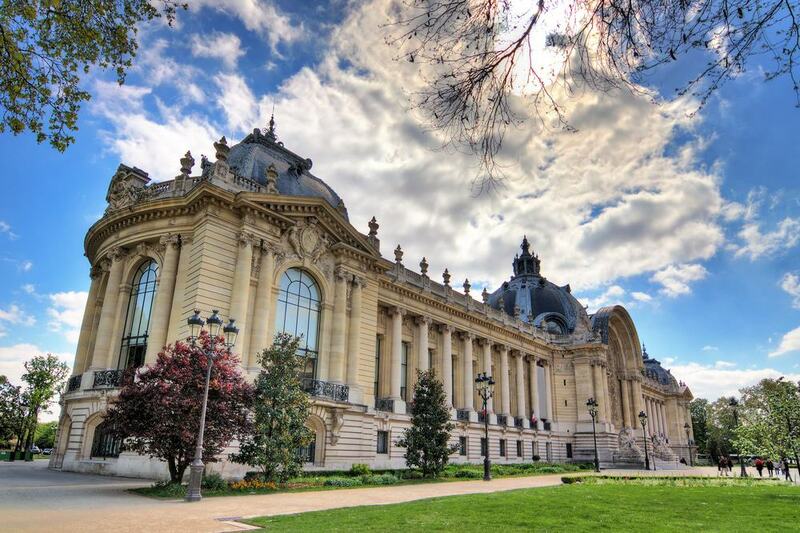 The Musée de l’Armée is France’s national military museum and has Medieval armour, canons, uniforms, military figurines, artillery, a Renault FT17 tank and a V-2 missile. The Dôme des Invalides is what many come for, a former church and burial place for military heroes. Here Napoleon’s red quartzite and green granite tomb sits in a circular hollow under the dome. Built by Napoleon III, the grand orangery of the Tuileries Palace’s is a sensational museum for Impressionist and modern art. The building had been put to a variety of uses before Monet donated his Nymphéas (Water Lilies) panels to the French government. These were a monument to the end of the First World War and are displayed in the orangery’s fabled oval rooms. More than 90 years later this cycle of eight paintings on the ground floor remains as subtly powerful as ever. In the basement you’ll be treated to pieces by some of the most illustrious names in the history of art, like Paul Cézanne, Matisse, Renoir, Rousseau, Sisley, Picasso and Chaim Soutine. 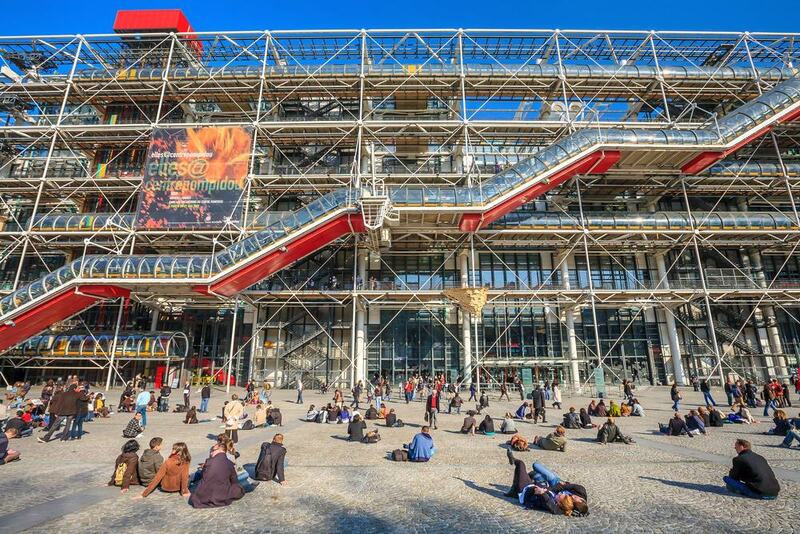 Now more than 40 years after it sprouted in the 4th arrondissement’s Beaubourg Area, the postmodern Pompidou Centre and its inside-out design can still provoke a reaction. Within, there’s an enormous library and alongside it is the IRCAM, avant-garde music institute. 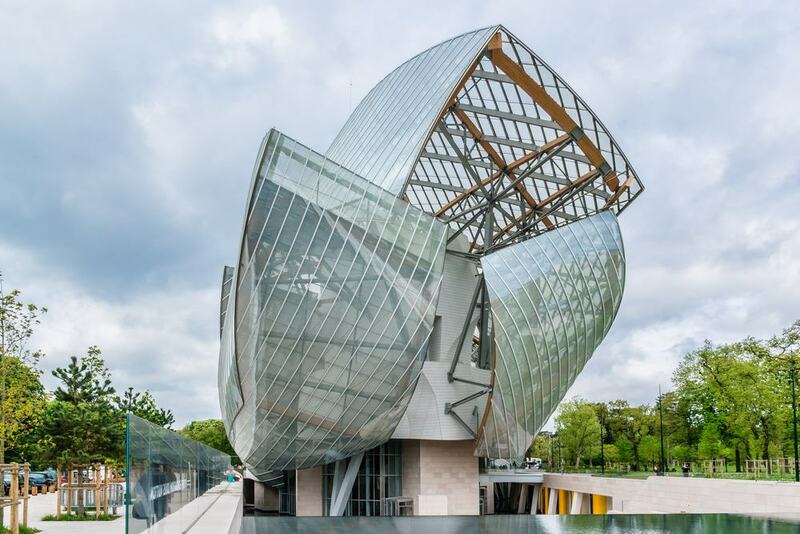 But the main event is of course the Musée National d’Art Moderne, Europe’s largest modern art museum and one of the 10 most visited art museums in the world. The collections take in every notable movement in modern and contemporary from 1905 to today. Think Matisse, Picasso, Kandinsky, Braque, Calder and Klee, but also giants from the last 60 years like Yves Klein, Warhol, Lichtenstein, Nam June Paik and Joseph Beuys. There are also major temporary exhibitions on the panoramic top floor: Jeff Koons, Henri Cartier-Bresson and Dalí have all featured in the last five years alone. On Place de l’Etoile at the western end of the Champs-Elysées is the monumental astylar arch erected to celebrate the victories and remember the war dead of the French Revolutionary and Napoleonic Wars. 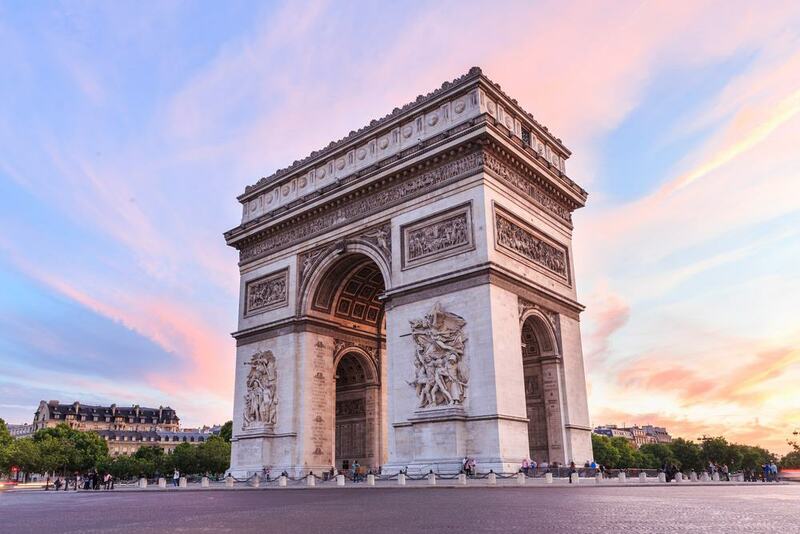 The Arc de Triomphe is also at the centre point of the Axe Historique, a long, straight line linking monuments from La Défense in the west to the Louvre in the east. And as for the arch its facades are carved with reliefs of key episodes from the 1790s and 1800s, like the Battle of Austerlitz and Fall of Alexandria. On the pillars are sculptural groups, including the iconic Marsellaise, which has a winged personification of liberty leading the volunteers, to symbolise the Revolution’s 10 August uprising. And finally, the names of the military leaders of the day are etched in the pillars, and those who died in battle are underlined. Embedded within the maze-like complex of the Palais de la Cité, the seat of France’s Kings up to the 1300s, the Sainte-Chapelle is a royal chapel constructed in just ten years up 1248. This is one of the first and most important works of Rayonnant Gothic architecture, a style known for its lightness and sense of height as you’ll know the moment you look up at the blue vaults trimmed with gold and dotted with fleurs-de-lis. The Saint-Chapelle was ordered by King Louis IX to contain the relic of Christ’s Crown of Thorns, which has since been moved to the Notre-Dame. And even though there was some damage in the Revolution the 15 breathtaking stained glass windows have survived almost unscathed since the 13th century and are held as some of the finest in the world. This museum on the eastern cusp of the Bois de Boulogne started out as a repository for works from the First Empire (Napoleon Bonaparte’s rule). But in the 1950s and 60s the Marmottan received a series of massive donations of Impressionist art, including one from Michel, the second son of Claude Monet. So in one stroke the museum had the largest single collection of Monet paintings in the world. Among them is Impression, Sunrise, Monet’s seminal depiction of the port at Le Havre that gave the Impressionist movement its name. There are also pieces from other luminaries of the period like Renoir, Degas, Gauguin, Morisot, Sisley and many more. That collection of art and decorative items from the Napoleonic era remains, together with a spellbinding set of Medieval illuminated manuscripts. Paris’s largest square was plotted in 1755 and completed in 1772 between the Champs-Elysées and the Tuileries Garden. Early on it was named Place Louis XV, while at the northern end of the square are a couple of splendid examples of the Rococo Louis Quinze architecture in fashion during his reign. But the times soon changed, and the equestrian statue of Louis XV was dismantled in 1789 when the square became known as Place de la Révolution. A guillotine was set up, and pillars of the French nobility, including Louis XVI and Marie Antoinette, were executed here. 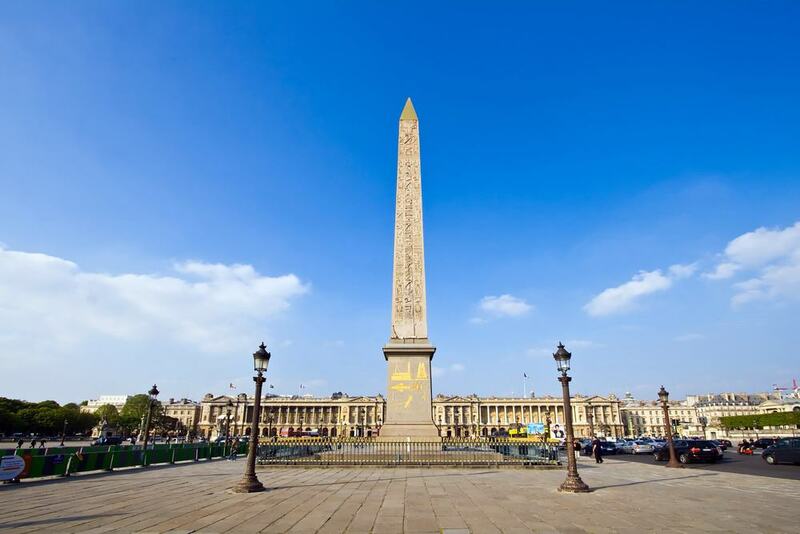 Today you have to see the fountains created during the reign of Louis-Philippe in the 1830s, and the 3,500-year-old obelisk at the centre, which once stood at the entrance to the Luxor Temple. In the Marais district allow an hour or so to bask in the historic ambience on this square. 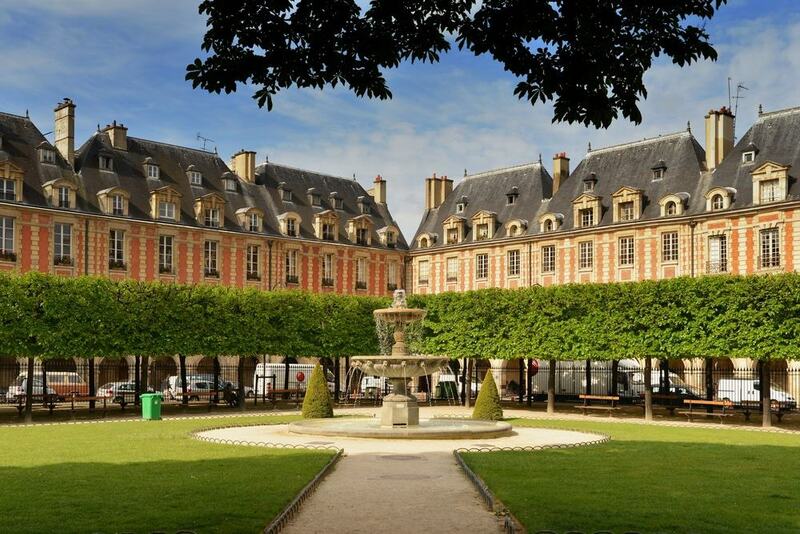 Designed and built in one go at the start of the 17th century, the Place des Vosges is what made the Marais so fashionable for Paris’ upper class over the next 200 years. The square is still lined with rows of red brick mansions in the Mannerist Louis XIII style, boasting dormer windows and white stone quoins. You can marvel at the arcades on the ground floor or take in the scene from the dainty garden in the square. Many of these mansions are now museums, including one preserving Victor Hugo’s residence. Some other distinguished former residents are the woman of letters Madame de Sévigné and Cardinal Richelieu. When August Rodin passed away in 1917 he bequeathed his works and personal collection to the French government, provided his workshop at the fine Hôtel Biron was converted into a museum. This mansion dates back to the 1700s and is a fitting backdrop for some of the world’s most celebrated sculptures. Rodin’s greatest works like The Thinker, The Kiss, The Burghers of Calais and The Gates of Hell all await. Rodin’s muse, Camille Claudel is also represented, and there are thousands of sketches and photographs, many owned by Rodin himself. Rodin was also an avid collector and gathered ancient antiquities from Egypt, Greece and Rome, as well as paintings by contemporary artists like Renoir and van Gogh. At the highest point of the Butte Montmartre hill is a monument born out of a catastrophe. 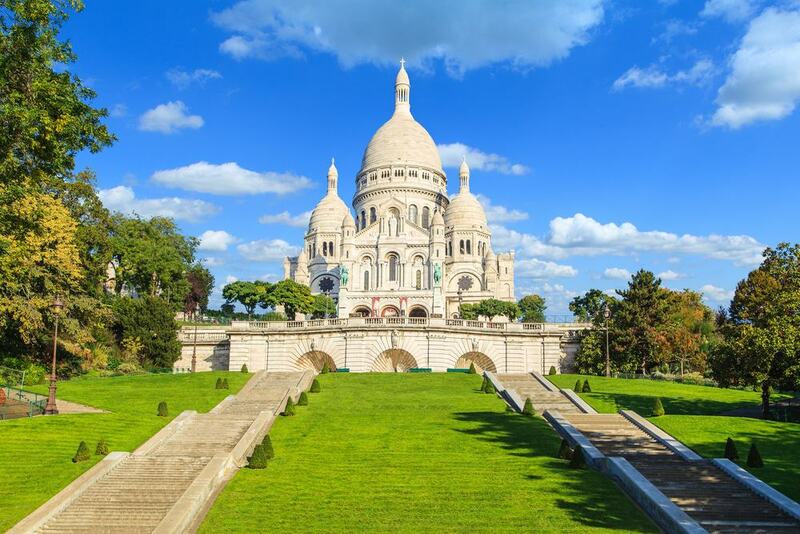 Designed as a Romano-Byzantine basilica, the Sacré-Coeur is known the world over and was started in 1875 as penance for France’s defeat in the Franco-Prussian War. The ghostly white stone is travertine quarried south of Paris at Château-Landon. You have to battle up Square Louise Michel below to be rewarded by what might be the best view of Paris. Head inside to see the apse, which has one of the world’s largest mosaics in its ceiling, named Christ in Majesty. For an even more complete view of the city you can scale the church’s iconic dome. 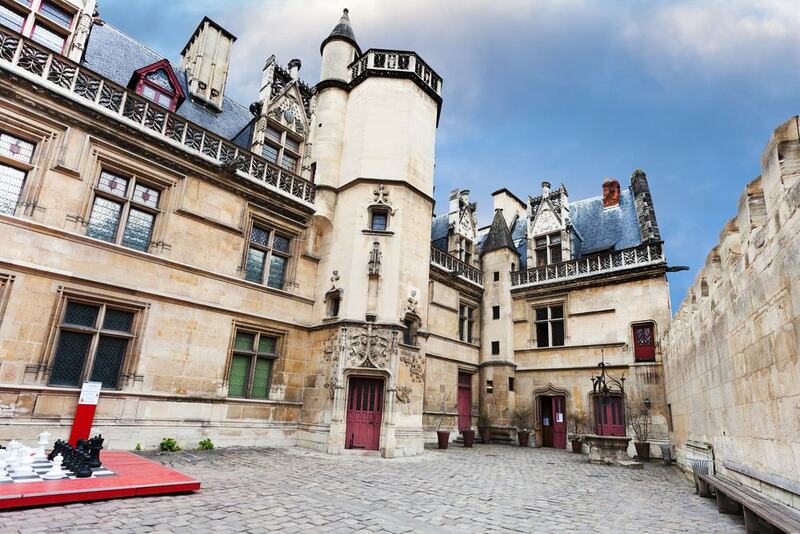 South of the Île de la Cité by the Sorbonne is in the sumptuous Gothic and Renaissance mansion of the Abbots of Cluny. The building’s earliest architecture is from the 14th century, and outside you can potter around the Medieval garden and courtyard dating to the 15th century and embellished with intricate stonework and mullioned windows. 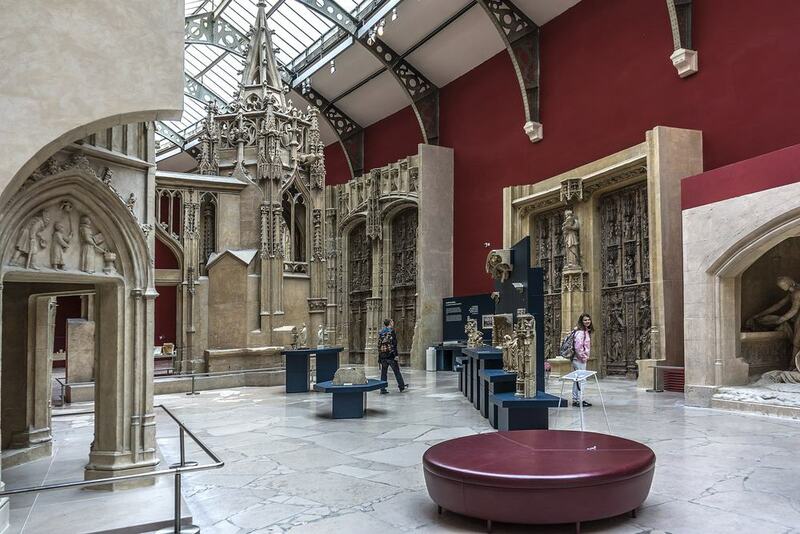 The interior abounds with Medieval art of the highest order and has stained glass, Limoges enamel, carved ivory, illuminated manuscripts, 8th-century gold, sculpted reliefs, architectural fragments and religious statues. Finest of all though is the Lady and the Unicorn, a set of six wool and silk tapestries woven in Flanders around 1500, seen by many as the pinnacle of art in the Middle Ages. Also on the site are the sizeable remnants of the 2nd-century Gallo-Roman baths, Les Thermes du Nord. In the 19th century Édouard André, the heir to a banking fortune, invested his wealth in an extraordinary art collection. André and his wife, the respected painter Nélie Jacquemart, had an nose for Italian Renaissance painting and would head off to Italy each year to buy the works that grace their mansion in the 8th arrondissement. On the tour of the couple’s state apartments, informal apartments, winter garden, an Italia gallery and private apartments there are paintings by Botticelli, Canaletto, Bellini, Perugino, Uccello, van Dyck, Rembrandt, Frans Hals, as well as sculpture by Donatello and Luca della Robbia. Another Beaux-Arts monument built for the Exposition Universelle in 1900, the Petit Palais is opposite its big brother the Grand Palais, between Pont Alexandre III and the Champs-Élysées. The building has a trapezoidal shape and in the Beaux-Arts spirit abounds with ostentatious decoration on its facade and in its central courtyard. 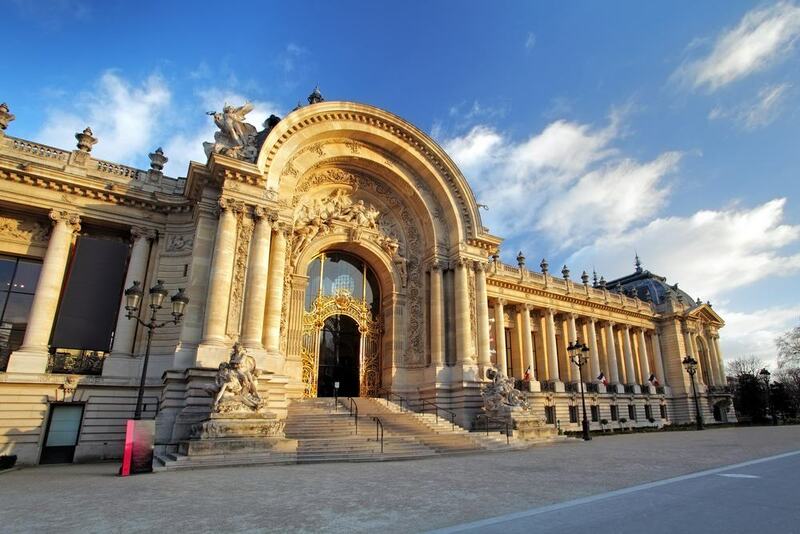 Inside is the City of Paris Art Museum, which holds its own against the many other cultural attractions nearby. With 1,300 pieces, the exhibition charts the entire history of art from antiquity to the 21st century. Best of all are the Old Masters like Poussin, Rubens and Rembrandt, as well as a complete timeline of 19th-century French painting from Ingres to Cézanne, via Delacroix, Monet, Courbet, Sisley and Pissarro. As much a hallmark of Paris as the Eiffel Tower or the Louvre, the Palais Garnier may well be the world’s most famous opera house. The venue was commissioned by Napoleon III to coincide with Baron Haussmann’s grand renovation of Paris in the 1870s. 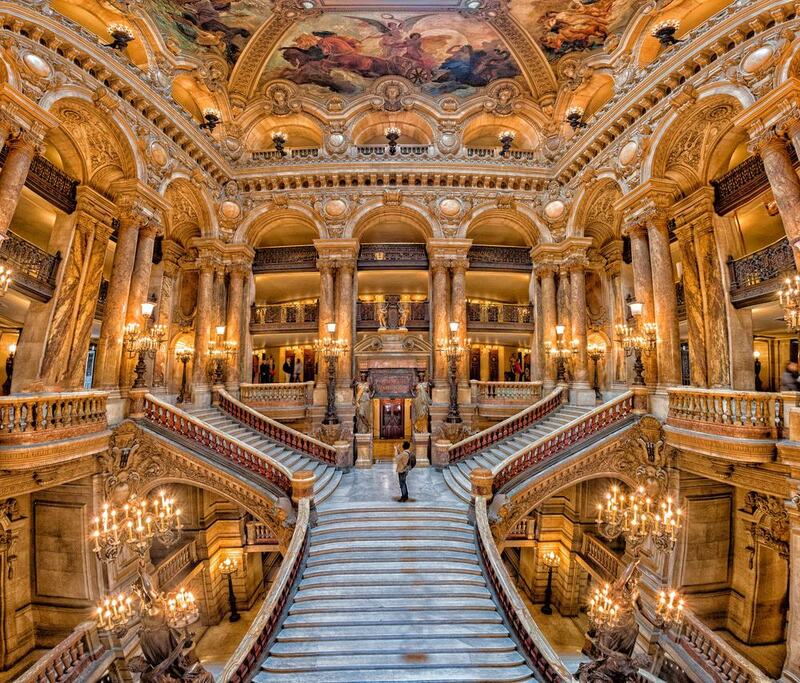 In an exuberant Beaux-Arts style, Palais Garnier is named for its architect Charles Garnier. The facade has busts of famous composers between its Corinthian columns above figurative sculptures embodying the arts. You could experience the interior as it was intended at an opera performance (expect to queue at short notice), or take a tour to be overwhelmed by the splendour of the Grand Foyer and Grand Staircase. 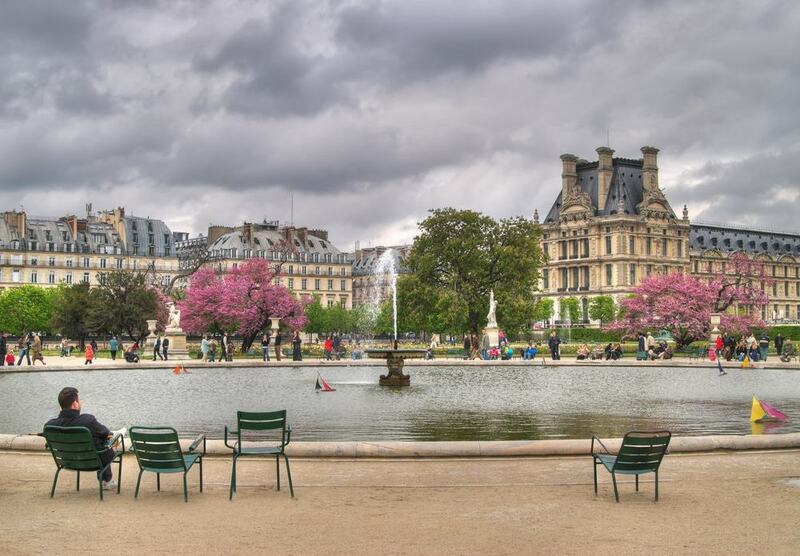 In the 6th arrondissement one of Paris’s go-to parks was conceived at the start of the 17th century by Marie de’ Medici for the Luxembourg Palace. The French Senate now sits at the palace, and also owns the gardens. In the summer you won’t find a better place to take a few minutes out from a busy day of sightseeing, amid this parterre of formal lawns and gravel paths. The Jardin du Luxembourg is also a sight of its own, dotted with more than 100 statues, among which is a series for 20 French queens and illustrious women commissioned by Louis-Philippe in 1848. Also present is an orchard with rare apple varieties, several greenhouses and an apiary. Not to be missed is the Medici Fountain, dating to 1630, but moved and updated in the 19th century. On the Axe Historique between the Louvre and the Place de la Concorde is the garden of the former Tuileries Palace. This space was first landscaped in the 1560s by Catherine de’ Medici on the site of former tile factories, which is where the name comes from. Later, the court landscape architect André Le Nôtre reworked the grounds in his French formal style, centred on the round Grand Bassin fountain. As a royal property, the Jardin des Tuileries only opened to the public after the Revolution. In 1792 it was the scene of a massacre when the palace was stormed by a mob trying to get to Louis XVI, and the Swiss Guard protecting the king was killed. The gardens are rich with public art by Giacometti, Rodin and Maillol. 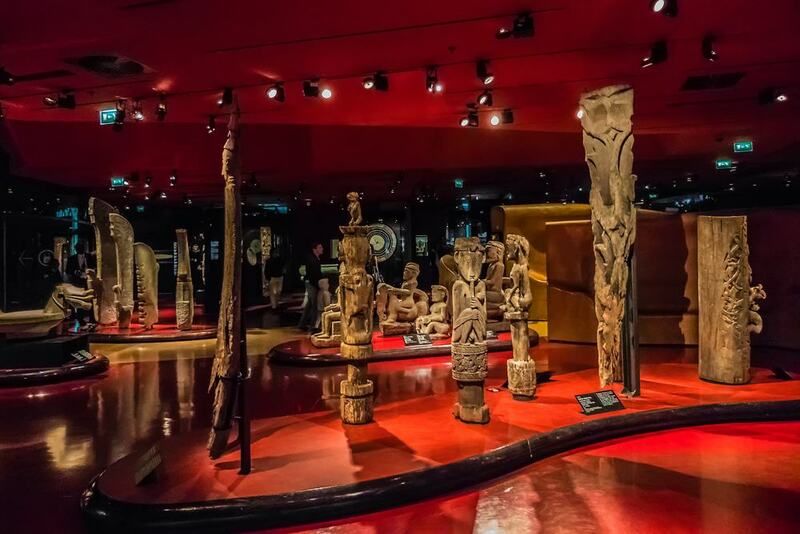 A few steps along the Seine from the Eiffel Tower is a museum for the indigenous cultures of Oceania, the Americas, Asia and Africa. There’s no danger of missing the Musée du Quai Branly because one of its buildings is literally alive. The “green wall” on the “Bâtiment Branly” is the brainchild of botanist Patrick Blanc and is made up of 15,000 plants of 150 varieties. In the dimly lit and creatively designed interior you’ll go on a winding trip through places and times, confronted by artefacts like Moorish brooches, West African ritual masks, Native American totem poles, portrait masks from Peru and a ceremonial throne from Indonesia. The museum gardens are also extraordinary, resembling a miniature wilderness, in an environment of pools, streams, tree groves and little hills. In the final decades of the 18th century Paris was in dire need of extra cemetery space. As grim as it sounds the mass graves at Les Innocents cemetery were quite literally overflowing at that time, so for the answer the city looked to a network of limestone mines dating back to medieval times. These are in the 14th arrondissement, 20 metres below street level where the temperature is a steady 14 degrees. Some six million bones were moved here up to 1810. 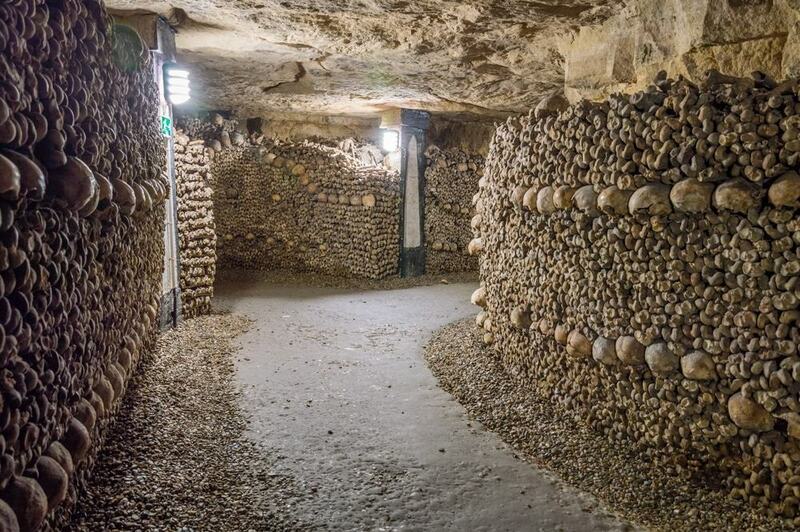 At first these were stacked randomly, but the engineer Louis-Étienne Héricart de Thury decided to make the catacombs a visitable mausoleum, and had the femurs, skulls arranged in jaunty, decorative patterns. People still get lost in this eerie, 1.7-kilometre maze of tunnels so remember to keep close to your guide! In 1988 the old railway line heading east through the 12th arrondissement was cleverly reconfigured into a park. The Coulée Verte runs for almost five kilometres from the Opéra Bastille to the edge of the Boulevard Périphérique using a viaduct and tunnels on the way. The lines dates back to 1859 and had been left abandoned since the 1960s before being regenerated by architects Philippe Mathieux and Jacques Vergely. In some places the vegetation that had cropped up along the railway has been kept, while in others, particularly on the Viaduc des Arts in the west, the Coulée Verte has been neatly landscaped with water features, trimmed hedges and manicured bushes. In the neighbourhood of the same name towards the south of the city proper is Paris’s second highest building. A 210-metre office skyscraper, the Tour Montparnasse went up in the early 70s and its black, monolithic outline stands out against the stone architecture beneath it. 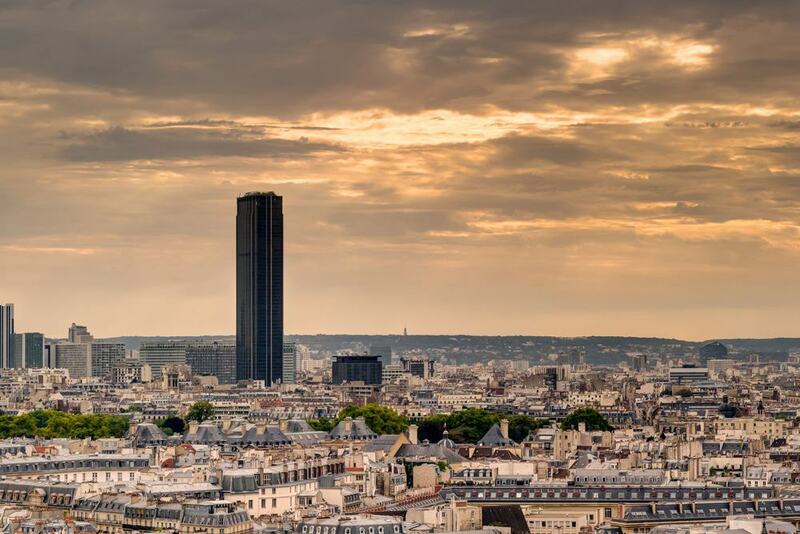 For this reason and many others the Tour Montparnasse has never been an object of universal affection. But one thing you can’t criticise the tower for is its view, partly because the Tour Montparnasse isn’t part of it! The fastest elevator in Europe will whisk you up 200 metres in 38 seconds. And at the top you can see more than 40 kilometres on clear days, behind the windows on the 56th floor or on the open-air terrace above. On a hill in the eastern 20th arrondissement, the Père Lachaise Cemetery opened at the beginning of the 19th century and is the city’s most coveted place to be laid to rest. The site itself has some history as it was once the home of François de la Chaise, Louis XIV’s confessor. Among the cemetery’s 70,000 plots are hundreds of important historical figures. The joy of a visit is tracking down their plots and checking out the Historicist designs of their mausoleums and memorial stones among in the surrounding greenery. And to give a sense of who’s buried here, the list includes Oscar Wilde and Jim Morrison, as well as French cultural giants like Balzac, Camille Corot, Chopin, Géricault, Molière, Pissaro and Edith Piaf to name just a few. In a labyrinthine building on the Rue de Rivoli between the Louvre and Tuileries is a museum for decorative arts from Medieval times to the 20th century. 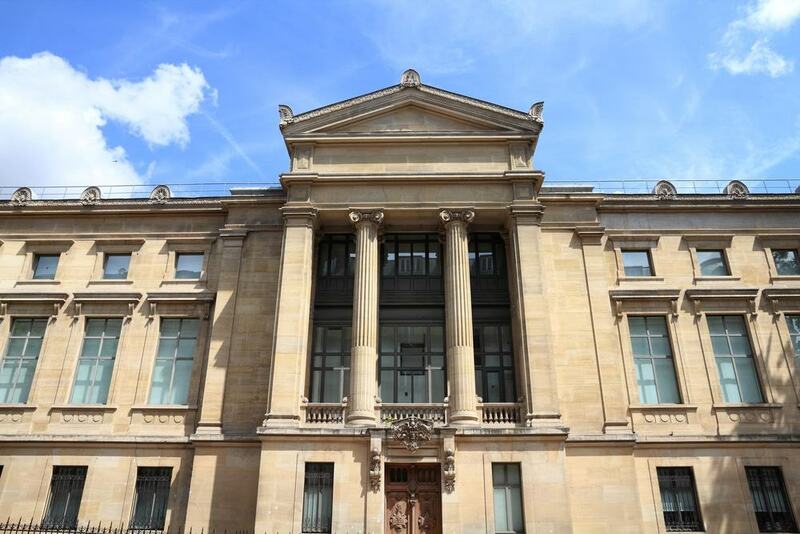 Established by the Union des Arts Décoratifs in 1905, the museum and its collection are vast. Around 6,000 objects are on show at any one time, from Renaissance tapestries, to tableware, graphic arts, silk wallpaper and sculpture. If you’re pushed for time you could decide to concentrate on one sphere, be it Art Nouveau and Art Deco design (covered by 10 whole rooms), or porcelain by the Sèvres Manufactory. The glass collection is the richest in France, and has incredible pieces by Lalique, Baccarat, Tiffany and Gallé to name a few. In 1911 the banker Moïse de Camondo had this regal Neoclassical mansion built in the 8th arrondissement to house his invaluable collection of decorative arts from the 17th and 18th centuries. The house has been preserved exactly as it was a century ago, with furniture and decorative pieces still in place. Anyone with an eye for French savoir-faire will be in their element among three floors of the finest furniture, textiles and porcelain. There are paintings by Élisabeth Vigée Le Brun, Savonnerie carpets woven in the 1600s for the Louvre’s Grand Galerie, Aubusson and Beauvais tapestries, and chairs, tables and desks by artisans associated the Garde Meuble (Royal Furniture Repository). On the Latin Quarter’s Montagne Sainte-Geneviève, the Panthéon looks out over the Seine and is where some of France’s most famous citizens have been interred. Constructed between 1758 and 1790, it was originally intended as a church. But no sooner was it completed than France was in the midst of the Revolution and Mirabeau ordered it to be secularised and turned into a mausoleum for great Frenchmen. 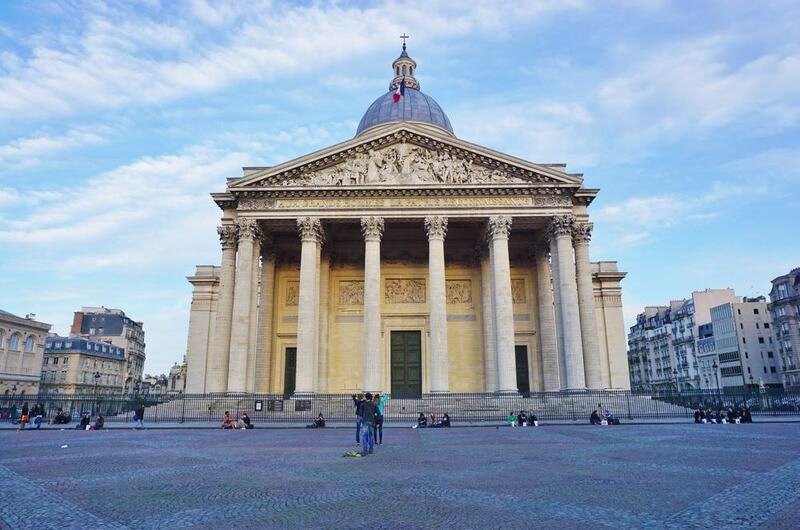 The Panthéon borrows from the Pantheon in Rome, and was one of the first Neoclassical buildings in France. Among the burials in the necropolis are the cream of French science, thought and culture, like Marie Curie, Rousseau, Voltaire, Victor Hugo, Alexandre Dumas and Émile Zola. 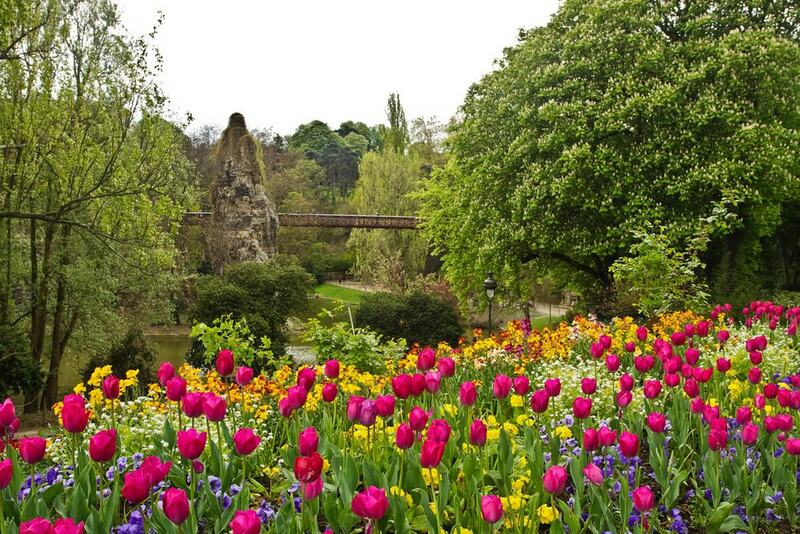 France’s chief botanical garden, the Jardin des Plantes has more than 10,000 species growing in themed gardens and greenhouses on the left bank. One of the centrepieces is the Alpine Garden, with 3,000 species next to twisting paths. There’s also an experimental garden, an Art Deco-style winter garden, an exceptionally diverse rose garden and Australian and Mexican greenhouses. On the north side the park has a small zoo, which was moved from Versailles during the Revolution. 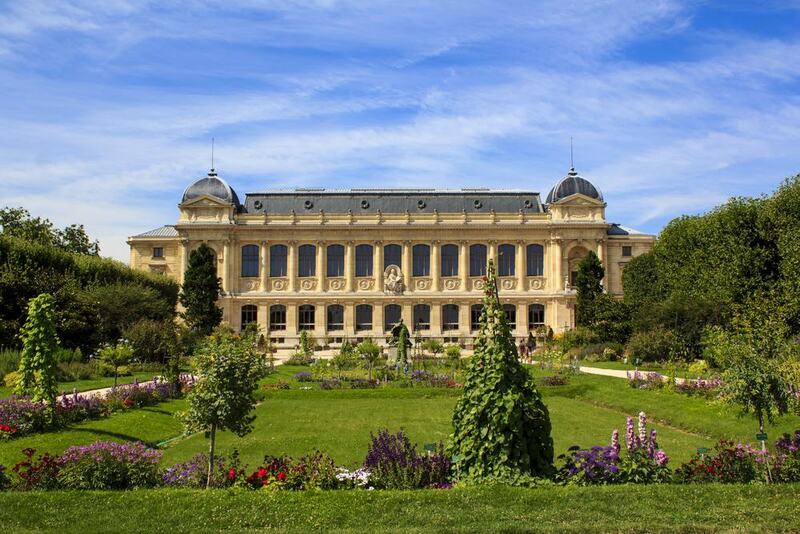 And on top of all that there are branches of the French Museum of Natural History on the edges of the park, including galleries for Palaeontology and Anatomy, Botany, Mineralogy and Geology and Evolution, all in separate pavilions. At the Saint-Martin-des-Champs Priory by the Arts et Métiers Métro station is a museum championing France’s greatest inventions. The setting is historic on its own, as the monastery buildings are among Paris’s best preserved pieces of Medieval heritage. But what’s inside them is even more thrilling. 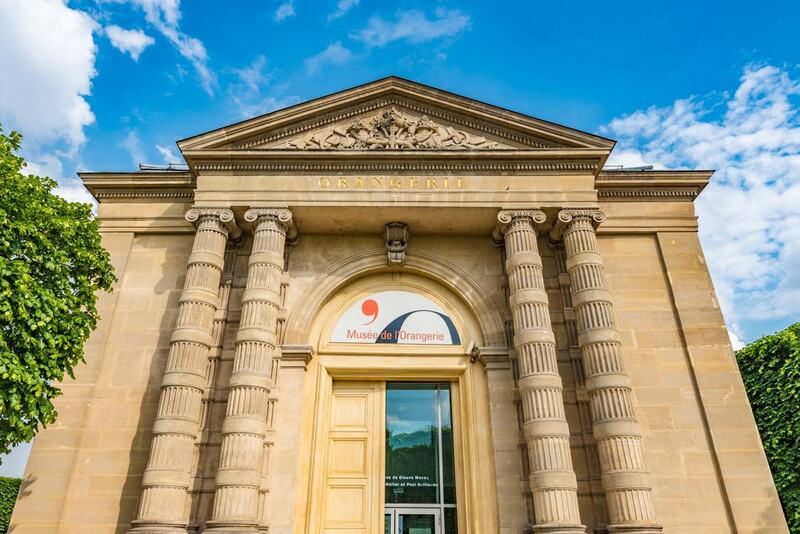 The museum was founded in 1794 to recognise French contributions to science and technology, and around 2,500 objects from an archive of more than 80,000 are on show. Some that helped change the world are Foucault’s pendulum, Bartholdi’s model of the Statue of Liberty, a host of early aircraft like Ader Avion III by Clément Ader, a Panhard & Levassor Type A (one of the earliest cars) and Lenoir’s Gas Engine from 1860. 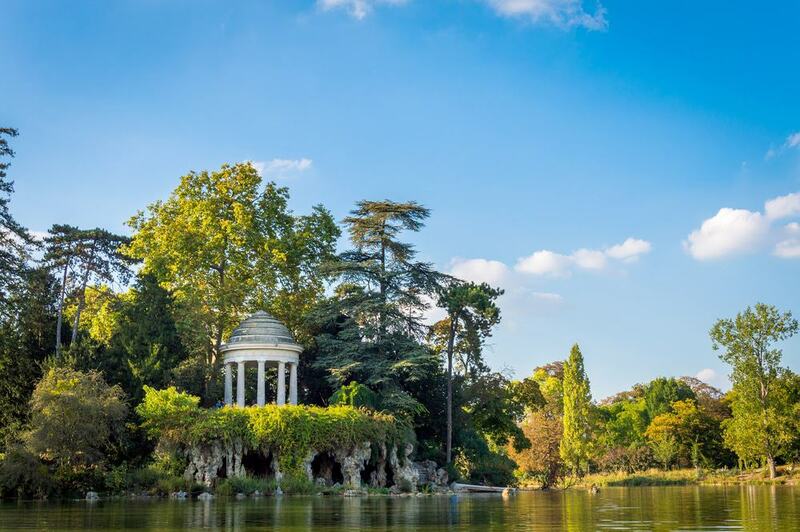 Southeast of the city, the Bois de Vincennes is the largest park in Paris at almost 1,000 hectares. To put that into perspective that is 10% of Paris’s total area! 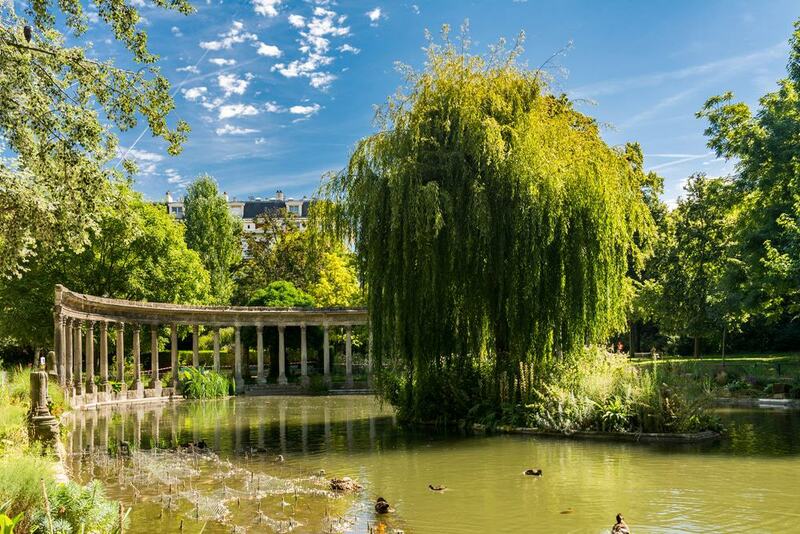 The park was founded between 1855 and 1866 as part of Napoleon III and Baron Haussmann’s Renovation of Paris. Long before that it had been a hunting park for the Medieval Kings of France, who resided at the Château de Vincennes on the northern border of the park. That property, famed for its towering keep was where the English King Henry V died in 1422. There’s a host of attractions in the Bois de Vincennes, which is hardly surprising for the park’s size. 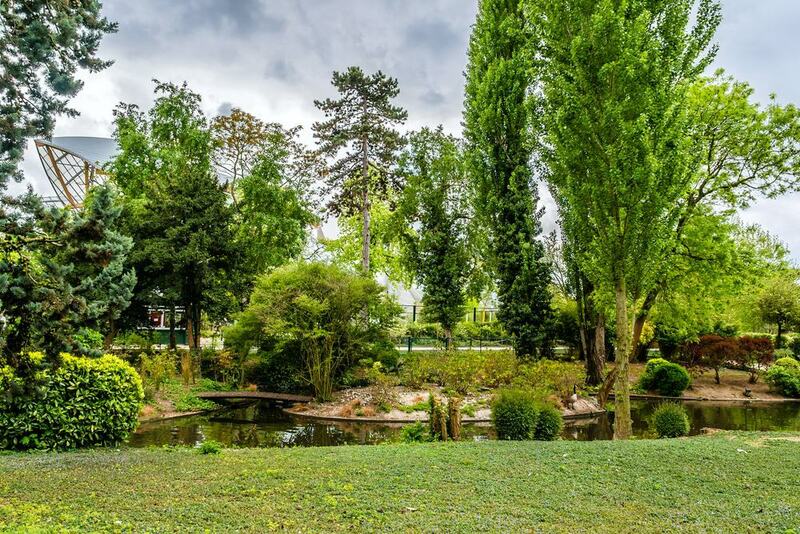 As well as the Paris Zoo there’s also the Parc Floral, a 31-hectare botanical attraction that has a sculpture garden with works by Alexander Calder and Alberto Giacometti. 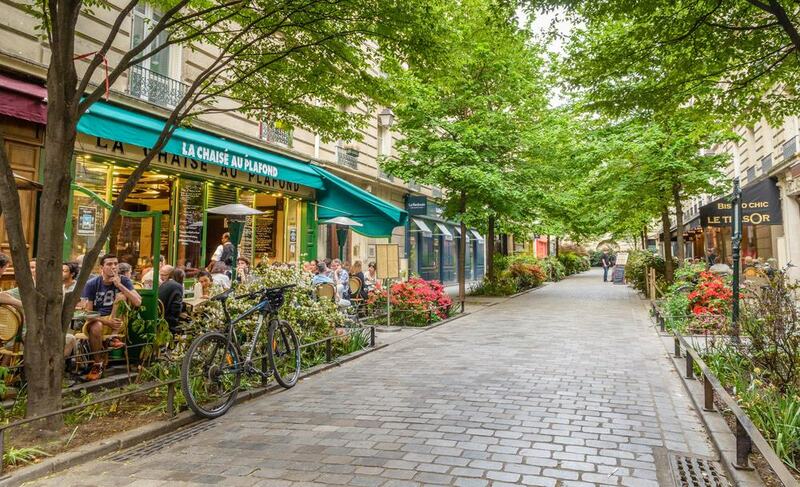 On the left bank of the Seine, Saint-Germain-des- Prés is a quarter that rose to fame in the middle of the 20th century when it became the haunt of thinkers, writers and artists like Jean-Paul Sartre, Juliette Gréco, Samuel Beckett and Alberto Giacometti. The quarter’s reputation for wild nightlife and non-conformism went back to just after the First World War: Low rents and proximity to the university drew young, fashionable types, and Saint-Germain-des-Prés was home to Paris’s jazz clubs and its gay community, which continued to thrive even in the Second World War. Now, although the louche ambience and artists have gone, Saint-Germain-des-Prés remains young, stylish and dynamic, and somewhere to come for bookshops, bars, galleries, historic cafes and design shops on narrow streets. Across from the Petit Palais, the Grand Palais is from that flurry of construction leading up to the Exposition Universelle in 1900. Crowned with Le Tricolor, the building is nothing short of spectacular and another of Paris’s enduring monuments thanks to its exuberant Beaux-Arts design and floating steel and glass vaults. The Grand Palais is still among the city’s top exhibition venues: At the time of writing there were concurrent exhibitions for Gauguin, Rubens and Irving Penn. Also inside is the Palais de la Découverte, a much-loved science museum founded in 1937. A fascinating exhibit here is the School of Rats, where real research is being done on the learning processes of animals. In the 3rd and 4th arrondissements, the Marais was once swampy, uninhabitable ground north of the city. 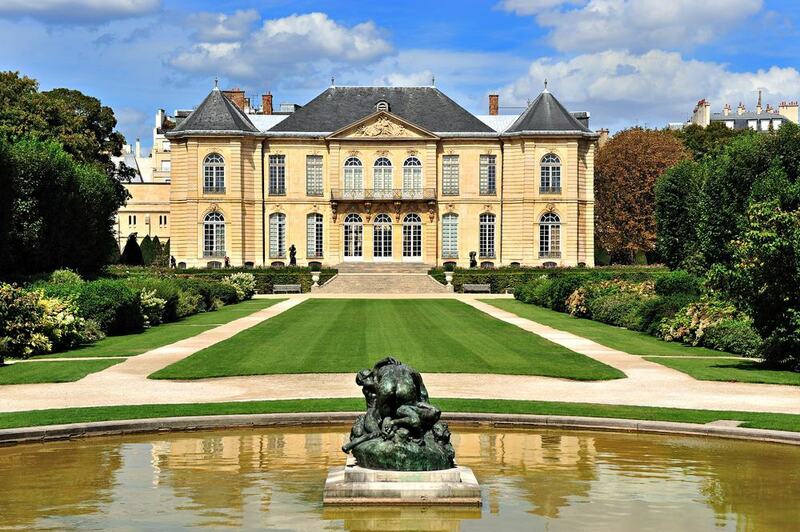 But from the 13th century to the 18th century it became the preferred address for Paris’s nobility. The neighbourhood’s golden age was in the 1600s and 1700s, when the delightful Place des Vosges was built. There are dignified properties from around this time across the district. 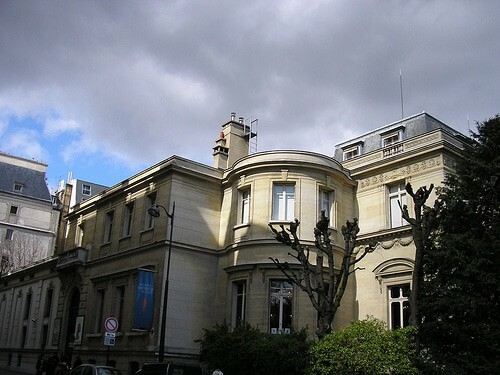 See the Hôtel de Soubise, now housing the Museum of French History, and the neighbouring Hôtel de Rohan, which holds the National archives. 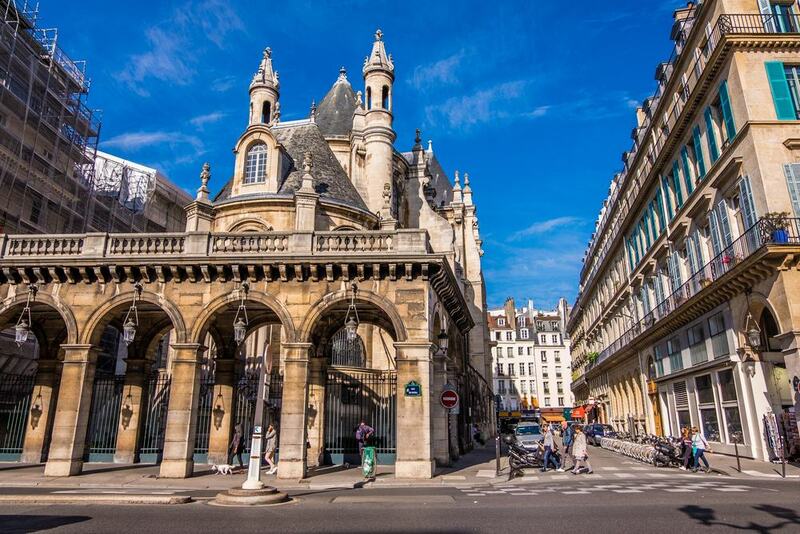 The Marais is now one of the hippest quarters in the city, with a large LBGT community, endless art galleries, artists’ ateliers and enough boutiques to last a lifetime. 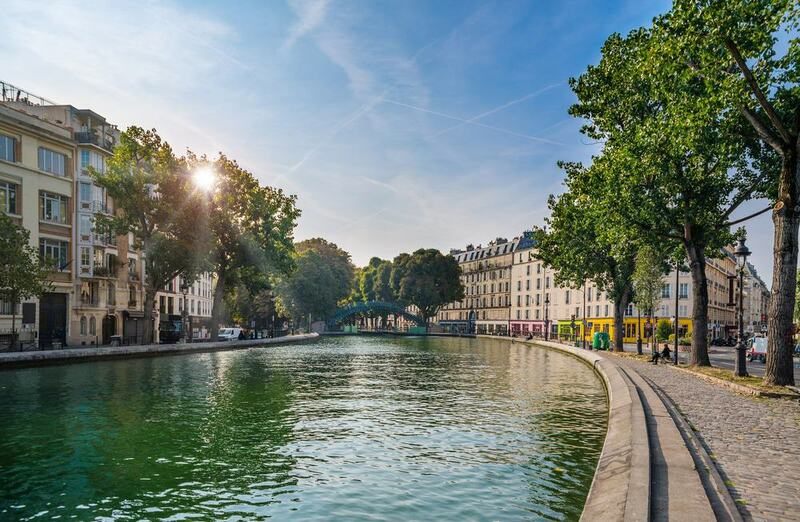 Crossing the cosmopolitan 19th, 10th and 11th arrondissements, the Canal Saint-Martin is 4.5 kilometres long and dates back 200 years. Beginning at the reservoir in Parc de la Villette, the canal is open-air all the way to Place de la République when it moves underground until Place de la Bastille. The canal was started under Napoleon in 1805 with the intention of channelling clean drinking water into the city and minimising diseases like cholera. Later that century warehouses were built on its banks, and these have since become stylish homes. The banks are lined with shops, cafes and bars with waterside terraces, and you can pause for a few minutes under the foliage in an area of the city not many tourists see. A byword for Belle Époque bohemianism, Montmartre is a more intimate Paris away from the grand boulevards and towering apartment blocks. These cobblestone streets on the stiff slope of the Butte Montmartre are flanked by cute, low houses and invite you to explore to your heart’s content. Montmartre was really put on the map in the last decades of the 19th century when Monet, Toulouse-Lautrec, Renoir, Pissarro, van Gogh and Modigliani lived and worked in the neighbourhood. There’s nightlife of course, and this becomes bawdier further down the hill in the Pigalle quarter, home of the Moulin Rouge. Look for the Moulin de la Galette, a 17th-century windmill immortalised by Renoir, van Gogh and Pissarro. An obligatory sight in Saint-Germain-des-Près, the Église Saint-Sulpice is Paris’s second largest church behind the Notre-Dame. Anne of Austria, Queen to Louis XIII, laid the foundation stone for a dramatic Baroque redesign in 1646, although work would drag on for almost a century due to conflicts like the Fronde civil wars from 1648 to 1653. The western facade, begun in 1732, was initially inspired by St Paul’s Cathedral in London, but was reworked throughout the 18th century to bring it more in line with Classical architecture. The grand scale of the church becomes clear as soon as you step inside: The highlight is the first side chapel on the right, the Chapelle des Saints-Anges, which has murals painted by Delacroix from 1855-1861. In the days of Ancient Lutetia, the Roman elites lived on the Montagne Sainte-Geneviève, now capped by the Panthéon. The name, Latin Quarter, doesn’t come from that time, but is related to the Paris-Sorbonne University: As Latin was the language of academia, lectures were held in Latin all the way up to the Revolution, so it was the main tongue in this part of the city. 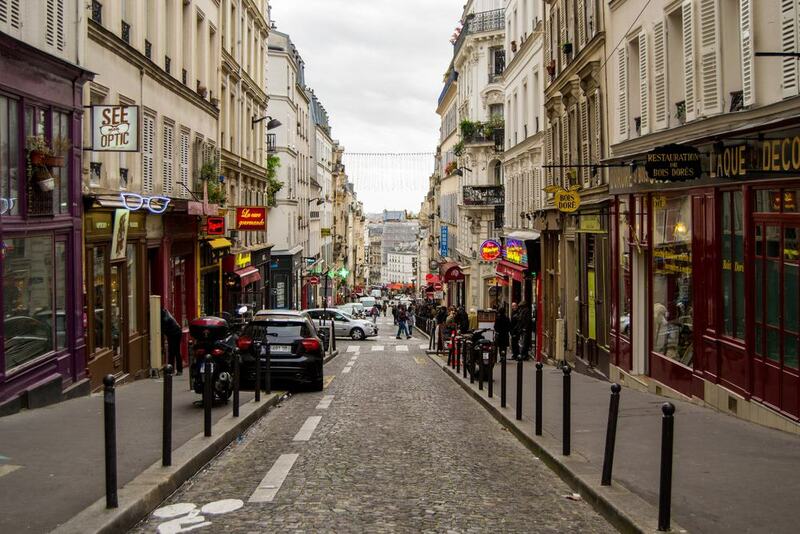 Despite rising rents, the Latin Quarter still has a young feel on its tangle of alleyways. That’s down to the many institutions of higher education and research centres. And the high concentration of young people made it the nerve centre of the protest movements in the 1960s that shook France to its foundations. In May 1968 students took Place St.
Michel and even declared it an independent state. Paris wouldn’t be Paris without its covered shopping arcades, which are mostly found in the 1st, 2nd and 8th arrondissements on the right bank. Nearly all are from the first decades of the 19th century, smartly cutting between two parallel streets to make the most of the limited space in the city at the time. Of the 150 passages before 1850, most were lost during Baron Haussmann’s renovation of Paris, but nearly all of the survivors are in immaculate condition and host tearooms, cafes and sometimes quirky, old-time shops. The swankiest are Passage du Grand-Cerf, Galerie Véro-Dodat and Galerie Vivienne. And two others worth a mention are Passage du Caire, the longest at 360 metres and hosting clothing wholesalers, and Galerie Colbert, which is owned by the National Institute of Art History and the only public passage without shops. As a city of art, serious museums and nightlife, Paris isn’t always ideal for kids. But a more convenient and much cheaper alternative to Disneyland Paris lies in the northern part of the Bois de Boulogne. This theme park has changed a lot since it was opened by Napoleon III and Empress Eugénie in 1860, but is old-school and traditional at heart. There are carousels, pony rides, a zip-line, a miniature train, an enchanted river ride, a boating lake, small roller coasters and all manner of playgrounds including one with water that is always a hit with little ones in summer. And ever-popular are the animal habitats for donkeys, sheep, alpacas, camels, pigs, or the peacocks that go where they please. On the southern fringe of the Jardin d’Acclimatation in the Bois de Boulogne is what looks like a massive mechanical creature crouching in the foliage. 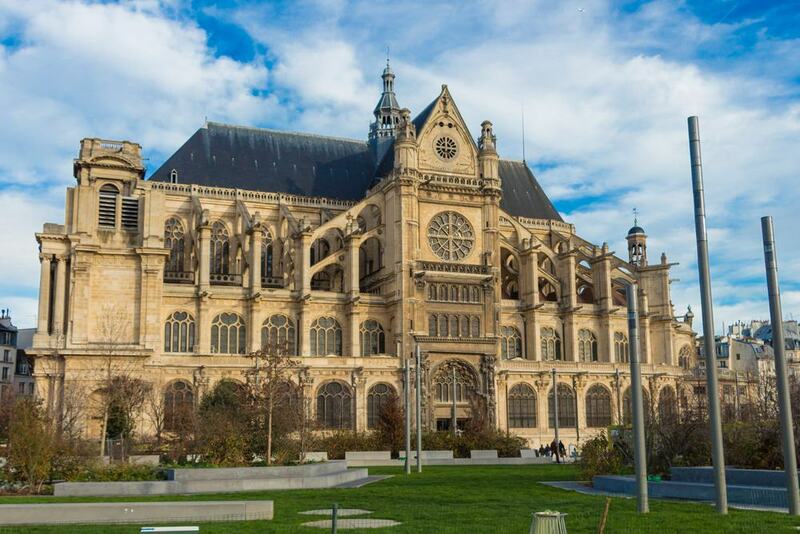 This is Paris’s newest major art attraction and opened in October 2014 after almost a decade of planning. The architect was Frank Gehry, as you might tell from one glance at the building’s abstract lines, comprising 12 “sails”. There’s a small exhibition about how this building was designed and constructed, and two headline-grabbing temporary exhibitions a year. At the time of writing this article the main event was an exhibition by MoMa with works by Picasso, Ludwig Mies van der Rohe, Max Beckmann, Jasper Johns, Gustav Klimt, Rem Koolhaas, Paul Cézanne and many more. 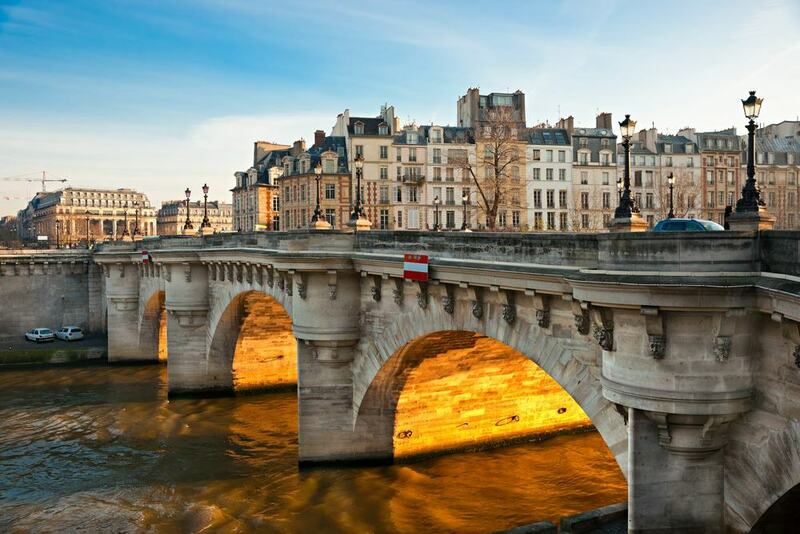 Translating to “New Bridge”, Pont Neuf is in fact the oldest stone bridge in Paris, begun in 1578 and completed in 1606. It crosses the Seine on the western point of Île de la Cité, and there are seven arches from the right bank to the island, and then five from the island to the left bank. Henry IV ordered the bridge, and he is remembered with an equestrian statue from 1618 at the point where the bridge crosses the island. Like many royal monuments the statue fell victim to the Revolution and was destroyed in 1792, but then restored in 1818. Come around to the side for a better look at the bridge’s “mascarons”, grotesque faces on the corbels in the cornice. You don’t need to count them, but there are 384 in all. At the dawn of the 20th century the banker Albert Kahn set out on a mission to record the world with photography and film. Over 22 years he sent photographers and cameramen to all corners of the globe,. And the project was only stopped by the Wall Street Crash. In the end “Archives of the Planet” amounted to 72,000 colour pictures and 180,000 metres of film. These form the basis for the museum exhibition. Outside are gardens of the world that he commissioned more than a century ago. 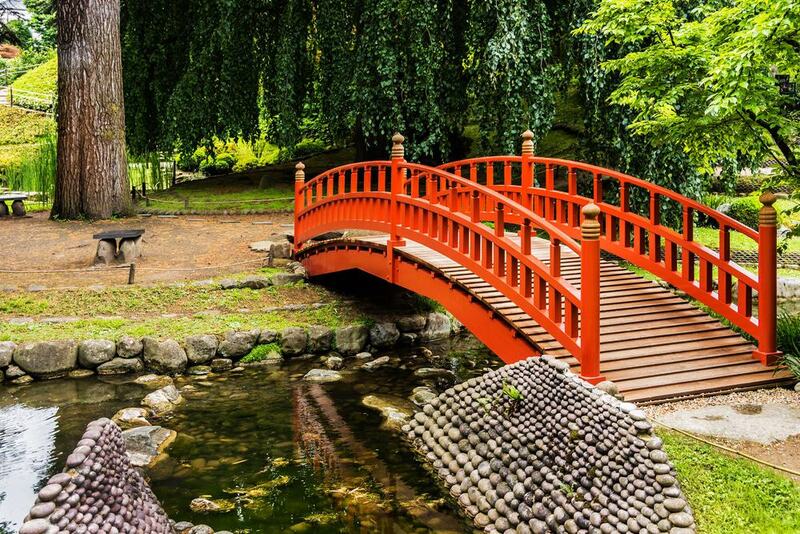 In four hectares there are French and English gardens, as well as a traditional and contemporary Japanese garden. Kahn also recreated a patch of forest from the Vosges, and a “blue forest” where azaleas and rhododendrons flower in spring. The industrialist Émile Étienne Guimet was an avid traveller and in the 1870s was sent to Asia to conduct a survey of religion on the continent. During his trip he amassed an inconceivably large and rich collection of art. The museum, which opened in 1889, is one of the largest arrays of Asian art outside Asia. And what’s clever about the exhibition is the way contemporary art is sprinkled in with antiquities. To give you sense of what’s in store, there are Indian fabrics, Greco-Buddhist sculptures from Afghanistan and Pakistan and Japanese samurai armour. And from China there are statues and porcelain, paintings and reliefs from various dynasties dating back to the Han Dynasty in the 1st century. If you have time to kill before your entry slot for the Louvre, you could do a lot worse than take a closer look at this stunning church on the east side. Saint-Germain-l’Auxerrois dates all the way back to the 600s, and has a mix of Romanesque, Gothic and Renaissance design. The 15th-century main portal is original, and has beautiful carvings on its archivolts and jambs, while inside is a sensational 13th-century wooden statue of Saint-Germain, a Flemish 16th-century altarpiece and a pew designed for Louis XIV by Charles Le Brun and Claude Perrault in the 1680s. Jean-Baptiste-Siméon Chardin, Charles-André van Loo and many other artists who once lived at the Louvre have their tombs at this church. Something else to divert you while you’re waiting to go into the Louvre is the most celebrated of the palace’s courtyards: The Cour Carrée was ordered by François I as part of the Western Extension in the 16th century and is held as one of the greatest achievements of Mannerist architecture in France. Pierre Lescot led the design between 1546 and 1551, producing a benchmark for French Classicism. Responsible for the ornamentation was the sculptor Jean Goujon, who contributed the masterful friezes, high-reliefs, drapery and statues in the niches from 1555 to 1562. Hop on Line 9 of the Métro to the western suburbs to visit the French National Ceramics Museum. Sèvres is the most revered name in French ceramics, and has been the site of a Royal, then Imperial and now National Manufactory since 1756. In 2010 a joint museum opened in Sèvres and at the other famous porcelain centre at Limoges. The Paris branch has almost 50,000 pieces of ceramics from all eras. The largest chunk of the exhibition deals with invaluable European porcelain from the 1400s to the 1800s, but there’s also Moorish earthenware, Ancient Greek ceramics, Chinese porcelain and terracotta from North America. 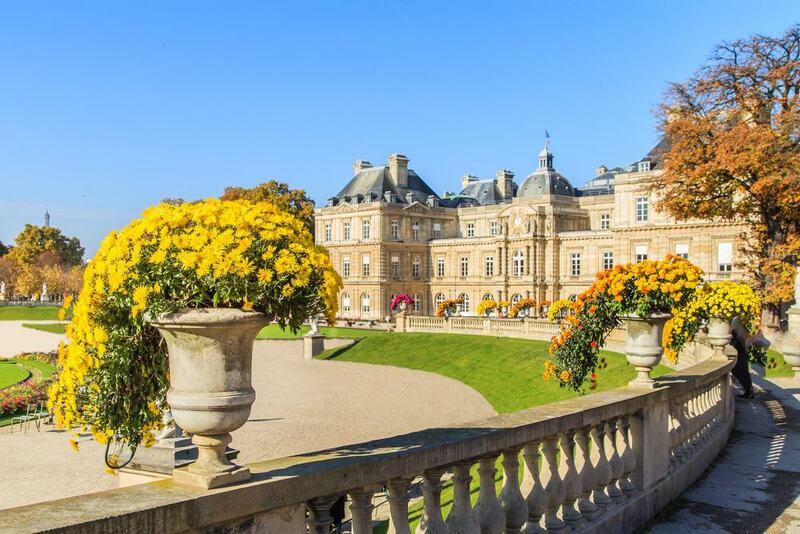 A French “Jardin Notable”, the Parc de Saint-Cloud is on the ground of a lavish royal property overlooking the Seine and blessed with a vista of the city to die for. The Château de Saint-Cloud had been a residence for Marie Antoinette, but was obliterated in the shelling during the Siege of Paris in 1870. Now, the outline of the old chateau has been marked by yew tree topiaries, while André Le Nôtre’s Baroque formal gardens are still here, along with Mare Antoinette’s rose garden. You can while away a few minutes at La Lanterne revelling in a panorama of Paris that not many tourists get to see. Completed for the Exposition Universelle in 1900, what may be Paris’s finest bridge is named after Tsar Alexander II, celebrating France’s ties with Russia. Built with a single arch to allow boats to pass below, you could call Pont Alexandre III the perfect Beaux-Arts statement in the way it combines technical mastery with extravagant decoration. On each bank there’s a pair of tall stone pedestals or socles, serving both as a counterbalance and decoration. They are topped with golden statues of Fames restraining Pegasus. The two on the right bank represent the arts and science, while those on the left bank are for commerce and industry. Then above the bridge’s arch are two nymphs to symbolise the Franco-Russian alliance, one for the Seine and one for St Petersburg’s Neva River. The smaller of Paris’s river islands, Île Saint-Louis is a just upriver from Île de la Cité and links to neighbour by the Pont Saint-Louis. Where Île de la Cité is full of pomp, this island is quieter and residential, but lovely in its own way. It was developed in the reign of Louis XIII from the beginning of the 17th century, and there are still a few handsome townhouses from this period. 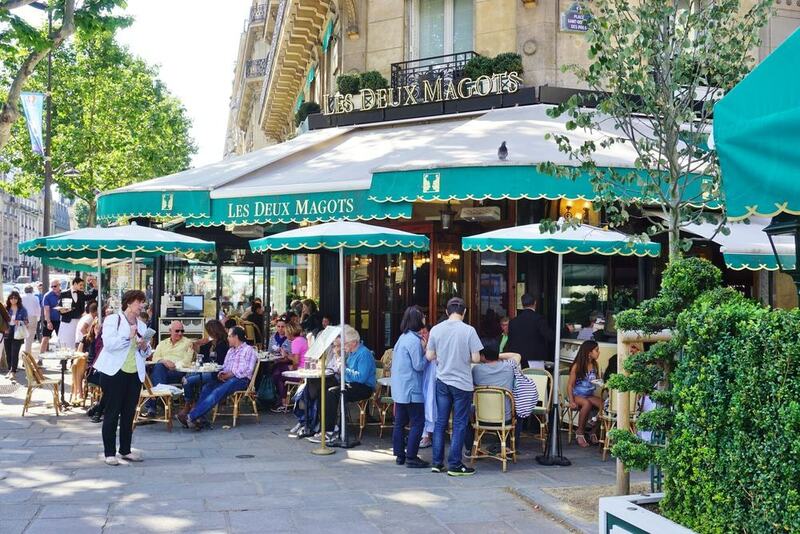 In the 1700s and 1800s this was a neighbourhood in the same vein as Le Marais or Faubourg Saint-Germain. The purpose of a visit now is to escape the crowds, explore its small grid of streets and dine at one of the bistros or brasseries. Berthillon here is an ice cream parlour with worldwide fame for its exotic sorbets like passion fruit and fig. In 1867 a park opened on what had only recently been a quarry for gypsum and limestone in the northeast of the city proper. The designer was Jean-Charles Alphand, Napoleon III’s trusted landscape architect during Baron Haussmann’s overhaul of the city. The old quarry was remodelled into a thing of beauty, reminiscent of Ancient Rome. At the top of a 50-metre cliff is the Temple de la Sibylle, based on the Temple of Tivoli in Vesta. In the rocky mass there’s also a grotto, which is a vestige of the quarry’s galleries. The picturesque waterfall inside the grotto is fed by waters from the Canal Saint-Martin and ends up in the lake at the base of the rock. In an old wine warehouse in the southeast of the city is an astounding collection of vintage fairground rides and automata put together by the art and antiques dealer Jean Paul Favand. There are 14 rides in total, among which are carousels and merry-go-rounds, as well as 16 stalls for games and more than 1,500 smaller curiosities like a Hooghuys Organ, all dating from 1850 to 1950. Up close you’ll see the craftsmanship and attention to detail that went into the sculptures on the carousels, amusement games and automata. Outside the Christmas period you have to sign up for a tour in advance. These are given in French but there’s a brochure in English explaining the exhibits. 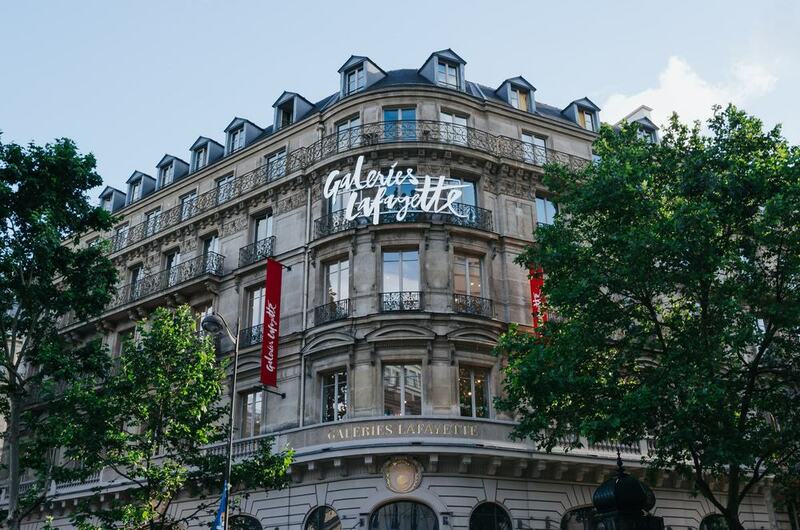 A quick jaunt from the Palais Garnier is the flagship of the revered department store brand, Galeries Lafayette. Receiving around 25 million shoppers a year, this one store generates 1.8 billion Euros in sales, more than London’s Harrods or New York’s Bloomingdale’s. The Galeries Lafayette Haussmann opened in 1894, and a location designed to catch Paris’s moneyed bourgeoisie. In 1907 it was given its first makeover, and this is when the monumental Neo-Byzantine was installed, 43 metres above the shop floor. A later update in 1932 gave the store its characteristic Art Deco styling. 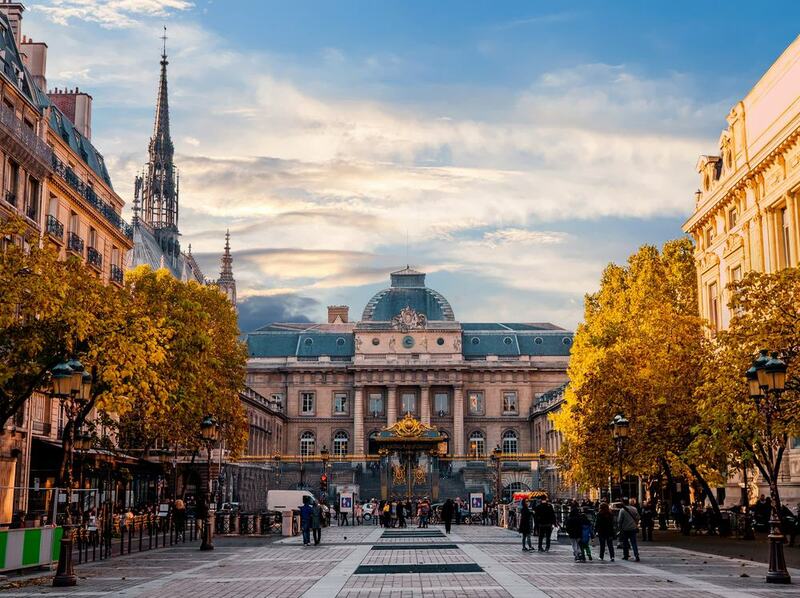 Luxury shoppers need look no further, but if you’re just here to see the sights, make sure to go up to the terrace to gaze over the Opera Garnier, Invalides and Eiffel Tower. Louis Philippe II, Duke of Orléans was a cousin of Louis XVI and wouldn’t be spared the guillotine during the Revolution. But from 1778 he built himself a park in what is now the extremely posh northern part of the 8th arrondissement. The park was right on the Wall of the Ferme générale, a system of tolls built not long before the Revolution to collect taxes on goods brought into the city. The big rotunda at the main entrance of the park is from 1787 and is one such toll station. There are original monuments from Louis Philippe’s garden like an ice house shaped like a pyramid and a gorgeous Classical colonnade beside the pond. In 1797-98 the aviation pioneer André-Jacques Garnerin performed world firsts with hot air balloons and parachutes in this park. 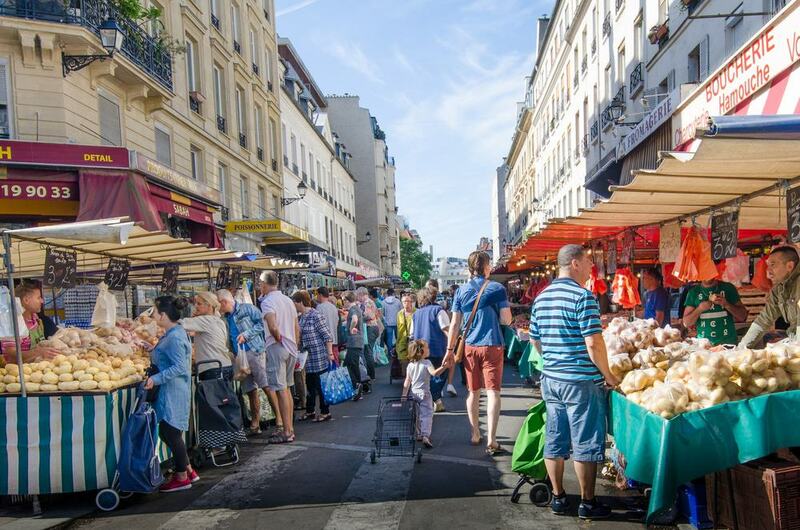 The best food markets in Paris are a little off the tourist trail, and there’s a great one in Quartier des Quinze-Vingts a couple of streets up from the Coulée Verte René-Dumont. A vital local amenity the Marché d’Aligre trades six days a week, and has both outdoor stalls and a covered market with three halls. At the permanent stalls inside are boucheries and charcuteries selling meat preparations from around France, so that might be cured Bayonne ham, rilettes, pâté, terrines, foie gras as well as chicken and pork cooked on rotisseries. The square outside is packed with noisy traders selling seasonal fruit, vegetables, flowers and fresh herbs. 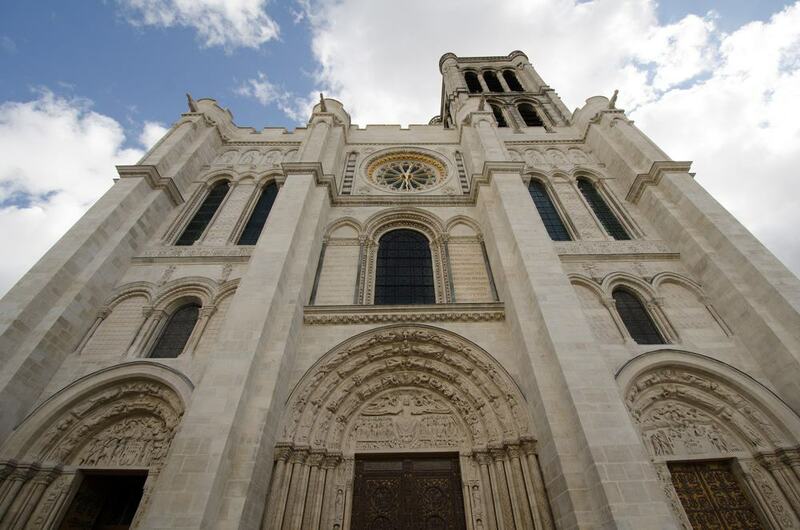 All but three Kings of France were buried at this Gothic church in the suburb of Saint-Denis. It’s a satisfying timeline of French history that begins with Clovis I in the 6th century and ends with Louis XVIII who died in 1824. The neighbourhood in the north of the city isn’t the prettiest, but is only a quick journey on the RER or Transilien trains. Your sense of adventure will be rewarded by dozens of stunning recumbent tombs sculpted between the 1100s and 1500s. The basilica was inevitably ransacked during the Revolution and the bodies were moved to a mass grave. When the Bourbons were restored to the throne after Napoleon the mixed-up remains were moved to the crypt where they’re kept in an ossuary and their names are marked by marble plaques. At the far western end of the Axe Historique is a district that looks like nowhere else in Paris. A jungle of futuristic glass and steel architecture, La Défense cropped up in the 1960s and new skyscrapers are still being built today. It goes without saying that not many people visit Paris for the skyscrapers, but if you’re fond of modern art and architecture La Défense is a must. More than 70 listed pieces of public art can be found here, most around the pedestrianised central extension of the Axe Historique, also home to the massive Quatre Temps mall. There are pieces by Alexander Calder, Joan Miró and Richard Serra, along with newer installations by the likes of Guillaume Bottazzi. But the undoubted emblem of La Défense is the 110-metre Grande Arche, clearly visible from Arc de Triomphe and completed in 1989. At the other end of the spectrum to Marché d’Aligre, Marché Poncelet is an upscale market in the affluent 17th arrondissement. Just one stop on the Métro from the Arc de Triomphe, it’s a given that you’ll have to pay a higher price for groceries and high-quality treats. The market is on Rue Poncelet and Rue Bayen, where permanent shops have counters along the street. There are wine merchants, fromageries, butchers, including one selling horse meat, a branch of the revered Daguerre Marée fishmongers, and of course enormous selections of fresh fruit and vegetables. Come by early and treat yourself to an oven-fresh croissant. 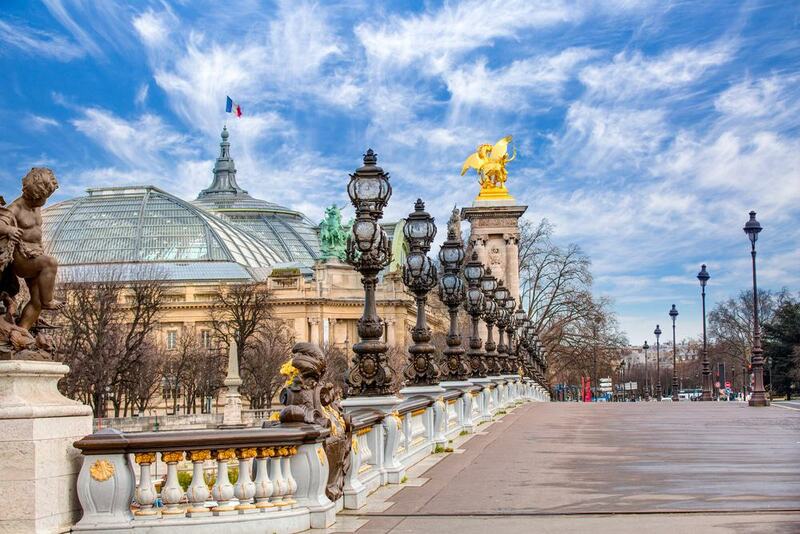 The terrace of the Palais de Chaillot has a view of the Eiffel Tower across the Seine that is etched in history. This building comprising separate eastern and western wings dates to the Exposition Internationale in 1937 and replaced Palais du Trocadéro, established 50 years earlier for the 1878 World’s Fair. 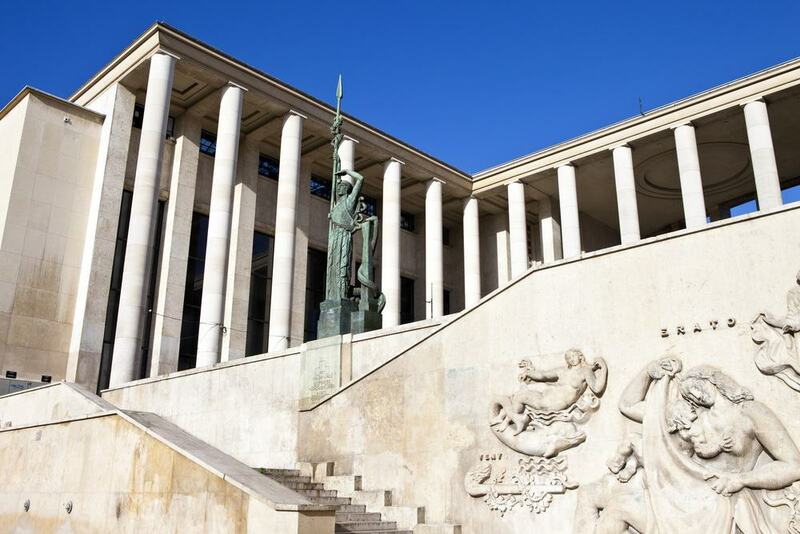 There are three museums in the Palais de Chaillot, the most fascinating of which is Museum of French Monuments, set up by the highly influential architect and restorer Eugène Viollet-le-Duc in 1879. In the exhibition are casts of the marvellous cathedral portals around the country, along with a gallery of stained glass and examples of innovative modern building designs, like a full-sized replica of an apartment by Le Corbusier. Many world-changing personalities have passed through the portal of this church at Les Halles. 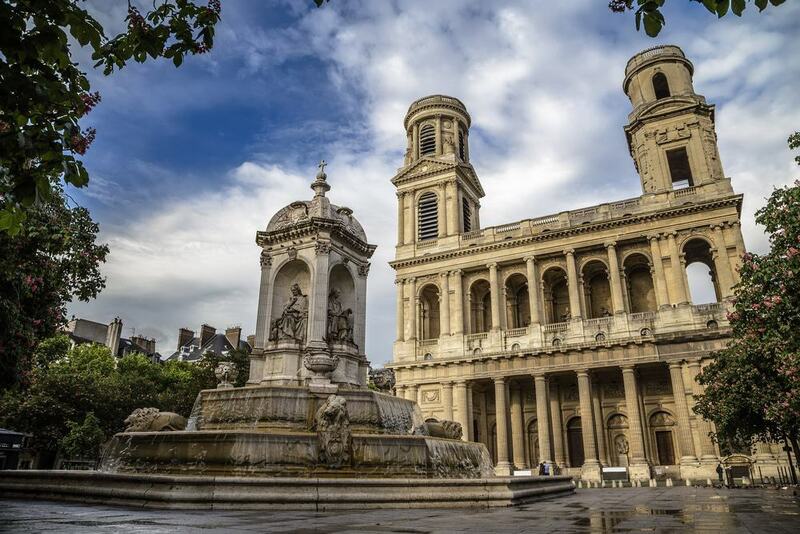 Louis XIV received his first communion at Saint-Eustache, while the future Cardinal Richelieu, Molière and future Madame de Pompadour were baptised here. Later, Mozart chose the church for his mother’s funeral and the last rites for Mirabeau were read at this spot in 1791. The church was started in 1532 and its architecture is made up of Renaissance ornamentation on a Gothic plan. Despite being relatively short the 33-metre vaults create an uplifting sense of scale and wonderful sound. Saint-Eustache also has France’s largest organ, and free concerts are given every Sunday, while symphony orchestras regularly take advantage of the building’s superlative acoustics. Near the Seine in the southeast of the city is the kind of eye-popping building that only Frank Gehry could have designed. 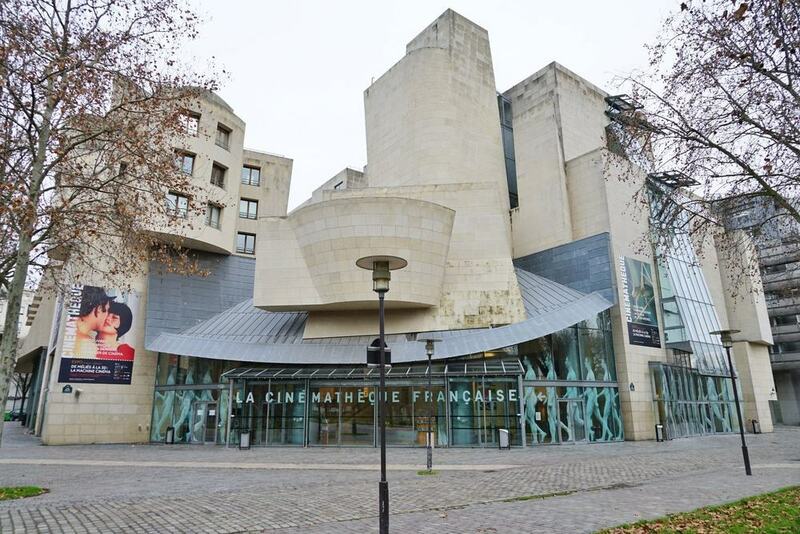 La Cinémathèque Française is in the former American Center, built in 1994, and is a repository of wonders from the history of cinema. There are magic lanterns from the 17th century (and a collection of 25,000 projection plates) and the inventions by Auguste and Louis Lumière, along with cameras, posters, sets, props and even costumes worn by Louis Brooks, Greta Garbo and Vivien Leigh. Every year a new heavyweight of film is chosen for an exhibition, and recent subjects have been Antonioni, Scorsese, Truffaut and Gus van Sant. 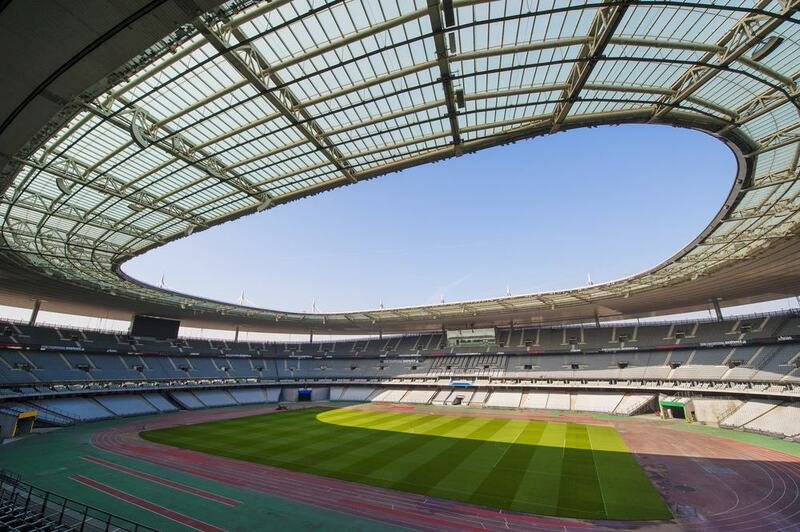 The other big draw in Saint-Denis is France’s national sport stadium. The Stade de France was constructed for the 1998 World Cup (won by France), and echoes with two decades of sporting memories. You can sample the atmosphere is at national football and rugby matches, or during the many concerts held each year. But if you’re keen to know the innovative methods used in construction, and want to go behind the scenes you can join one of the daily 90-minute tours taking you pitch-side and into the dressing rooms. On the way there’s tons of memorabilia like signed sports jerseys and guitars, as well as handprints left by some stars who have performed in the stadium like Zidane, Laurent Blanc and Jonny Wilkinson. Up to the 14th century the Conciegerie (part of the Palais de la Cité) was the seat of the French kings until Charles V moved across to the Louvre Palace in 1358. 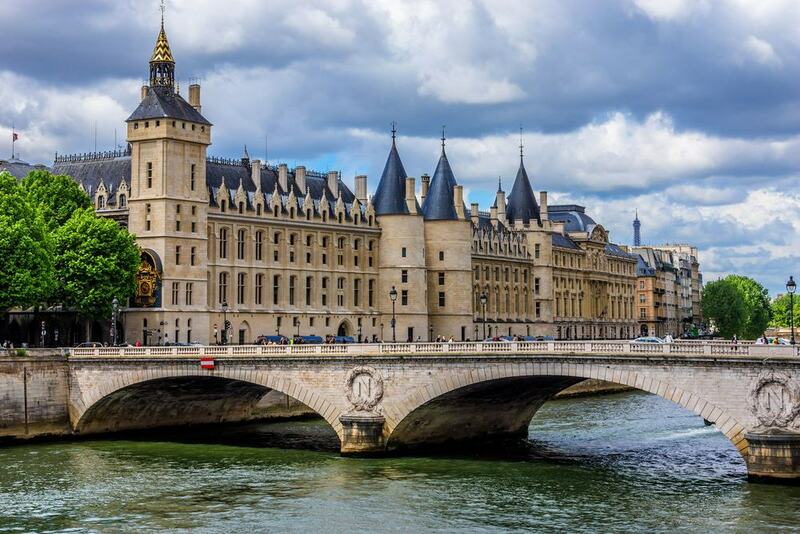 From the end of the 14th century all the way up to the 1900s the Conciergerie was used as a prison, where inmates were organised according to their wealth. The most notorious phase was the Revolution when Marie Antoinette was counted among the prisoners, but Napoleon III was also an inmate after a failed coup against King Louis Philippe. Today the building is mostly taken up by law courts, but a large section is open to the public, revealing the historic kitchens and Gothic Salle des Gardes (Gaurds’ Hall) and Salle des Gens d’Armes (Soldiers’ Hall). 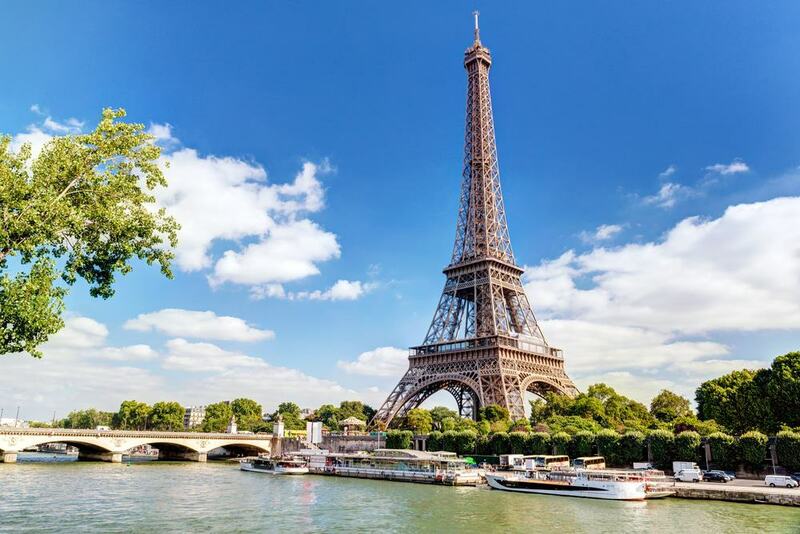 To encounter Paris at its most palatial, continue along the Champ de Mars from the Eiffel Tower to enter the Faubourg Saint-Germain, France’s most wealthy district. Up to the 17th century this patch of land on the left bank of the Seine was all marshes and farms before Louis XIV built Les Invalides. And slowly, over the course of the 1700s Paris’s nobility started to switch their attention to this quarter from Le Marais, as the left bank was quieter and less polluted. One of the finest palaces built in that time are Palais de la Légion d’Honneur, originally built in the 1780s for Frederick III, Prince of Salm-Kyrburg, who was guillotined in 1794.The Prime Minister’s residence, Hôtel Matignon (1725) is also in the district, and was built at such great expense that its owner was forced to sell as soon as it was finished. The Boulevard Richard Lenoir, lying on top of the Canal Saint-Martin, welcomes one of Paris’s biggest and fanciest markets every Thursday and Sunday. From roughly 07:30 ’til 14:30 on Thursday and 15:00 on Sunday there several supermarkets’ worth of produce at more than 100 stalls. These are laden with fruit, vegetables, fresh herbs, charcuterie, eggs, cheese, preserves, bread, pastries, fish and seafood. All this goodness is bound to leave you peckish and there’s no lack of stalls selling freshly shucked oysters and white wine to go with it, potato gratin, or chicken hot of the rotisserie. Yes it may be a cliché, but there’s logic to taking a cruise on the River Seine. And that’s because so many of the Paris’s monuments are on the river, from the Eiffel Tower in the west to the Notre-Dame in the east. With continuous guided commentary to fill you in, you’ll float past the famous embankments and under bridges like Pont Neuf and Pont Alexandre III. 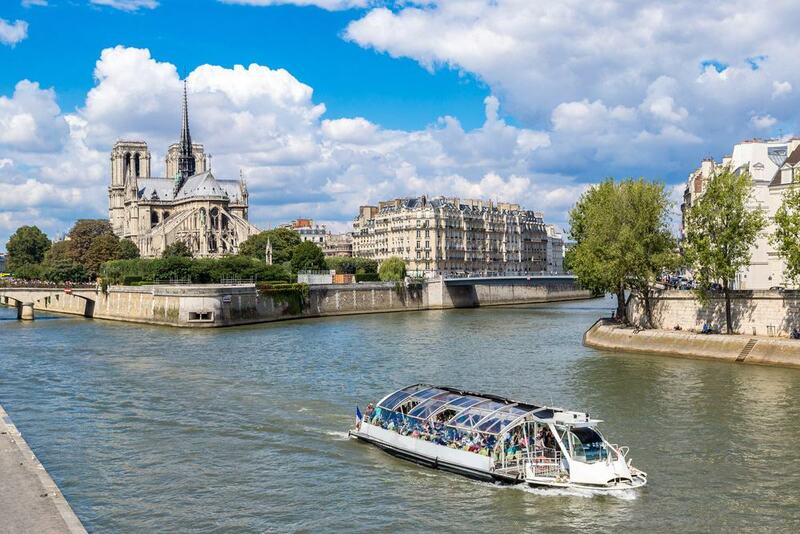 The river excursions business is run by a duopoly of Bateaux Mouches and Bateaux Parisiens, and both provide a menu of cruises whether you want a simple sightseeing trip in a glass boat or fine dining on the water in the evening. If you’re waiting for a train at Gare de Lyon, give yourself a minute or two to amble along this sweet pedestrian street close by. With its shutters and colourful pastel painted walls, Rue Crémieux looks like it could be in a village in the south rather than one of Paris’s busiest transport hubs. Some of the odd-numbered houses on the east side have trompe l’oeil paintings of birds, vines, windows or timbers, and every house on the street has a little flourish of plants and flowers in pots along the pavement. 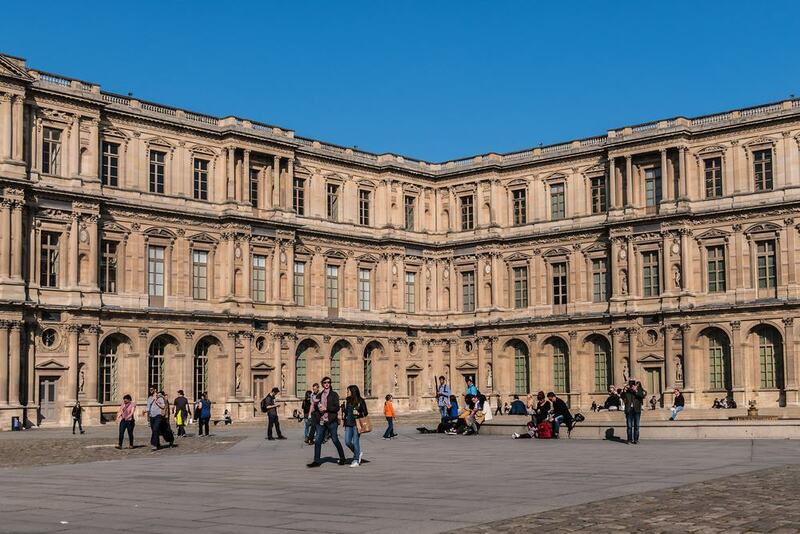 Now occupied by the Constitutional Council and the Ministry of Culture the Palais-Royal is a former royal property opposite the Louvre just off Rue Saint-Honoré. The palace’s first name though was Palais-Cardinal, and Richelieu lived in the palace up to his death in 1642. One of many important tenants was Philippe II, Duke of Orléans, who was regent after the five-year-old Louis XV ascended the throne in 1715 and formed a government at the Palais-Royal. 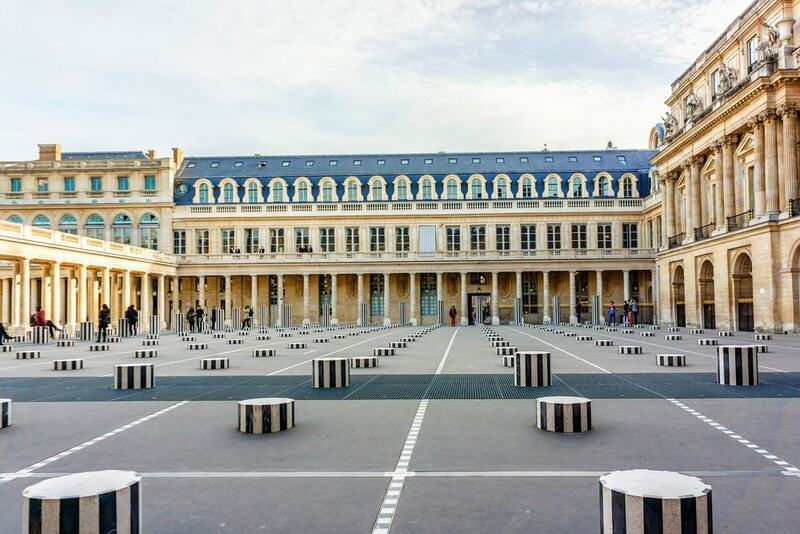 At the inner courtyard is Les Deux Plateaux, an art installation of striped columns of varying sizes by Daniel Buren. Walled by the palace’s arcades are the 18th-century gardens, designed by Victor Louis, with straight, precise rows of trees trimmed to right angles and a circular basin at the centre. 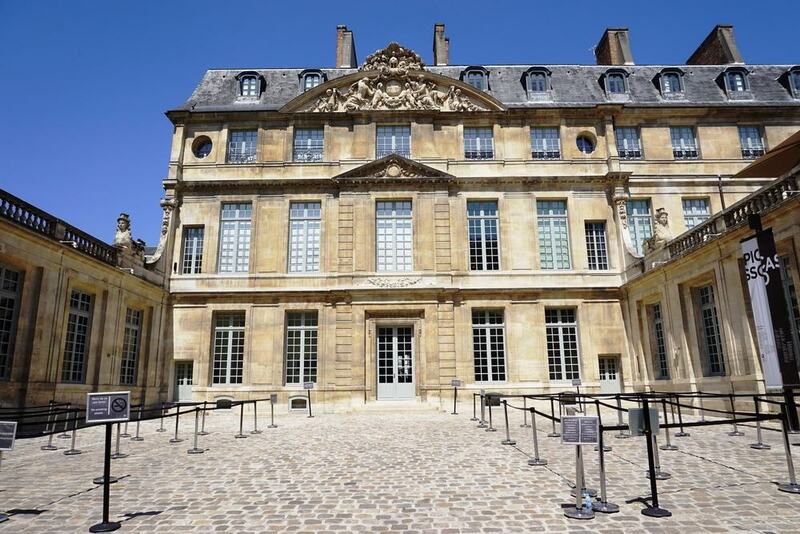 In Le Marais the Musée Picasso reopened in 2014 after a five-year renovation. The museum is in the refined Hotel Salé, a Baroque townhouse commissioned in the 1650s for a tax farmer collecting salt tax, which explains the name. The museum is state-owned, and gathered its collection by allowing Picasso’s descendants to pay inheritance tax in the form of art. Since 1968 it has assembled a remarkable array of works, more than 5,000 in total, charting each of Picasso’ phases, but also revealing his creative process. The sculpture collection is acclaimed, but there are also paintings, sketches, drawings, engravings, illustrations, photographs and filmed footage. Some of Picasso’s private collection is also here, from ancient Iberian Bronzes and African statues to paintings by Matisse, Degas, Seurat and Paul Cézanne. 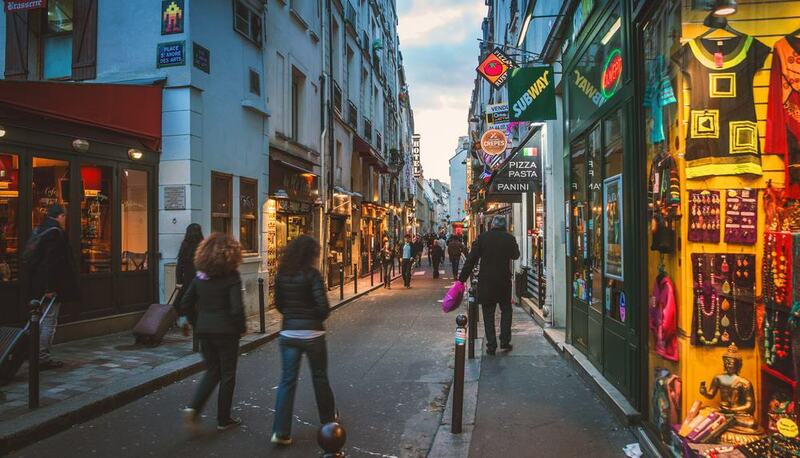 If you’re in the mood for an idle stroll there’s no better street than Rue Saint-Honoré. East to west, this street is roughly parallel with Rue de Rivoli and runs from Les Halles to La Madeleine the famed 12th-century church re-founded as a Neoclassical temple by Napoleon. 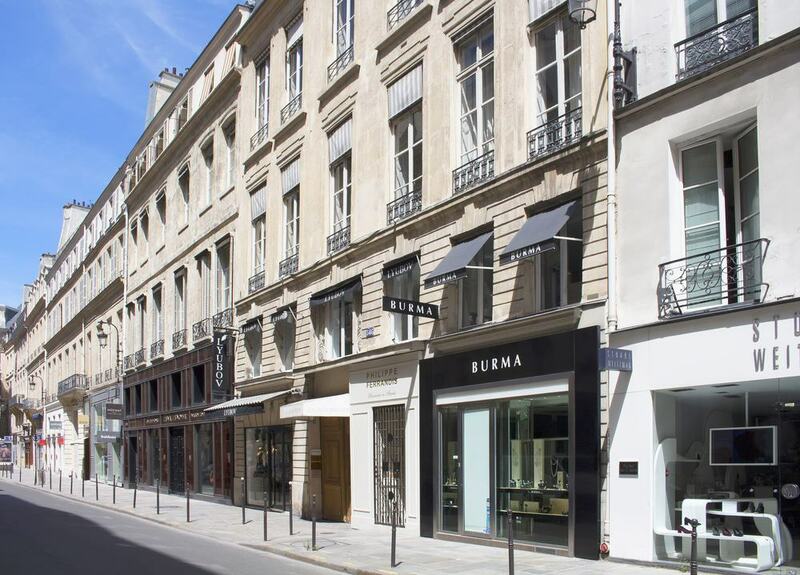 If there’s a luxury brand worth its salt, you’ll find it on Rue Saint-Honoré. The high-end shops are clustered around the west end of the street where there are names like Max Mara, Valentino, Gucci, Dolce & Gabbana, Jimmy Choo and Fendi at every turn. There’s lots of interesting trivia tied to the street: Joan of Arc was wounded here in 1429 during an attack on Paris when it was controlled by the English, and in 1610 Henry IV was assassinated just off the eastern end on Rue de la Ferronnerie by a Catholic fanatic. 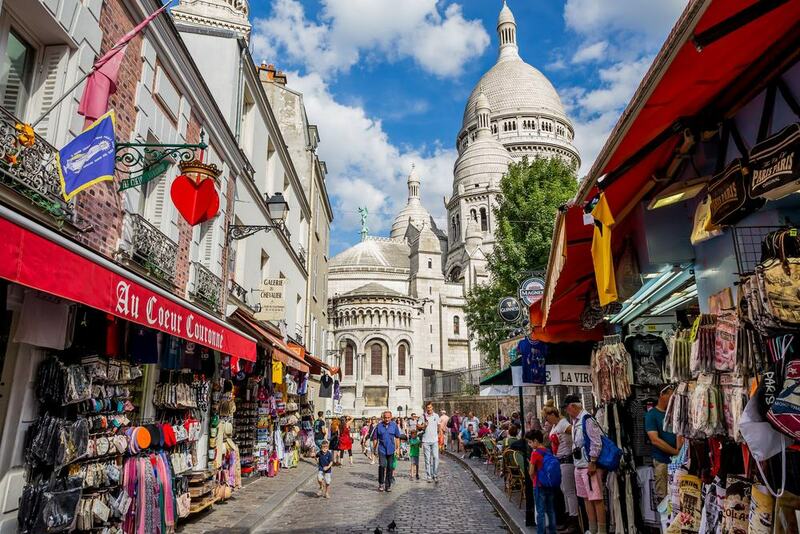 On the other side of Montmartre, just beyond the Boulevard Périphérique is a market with the largest concentration of antiques dealers and second-hand shops in the world. 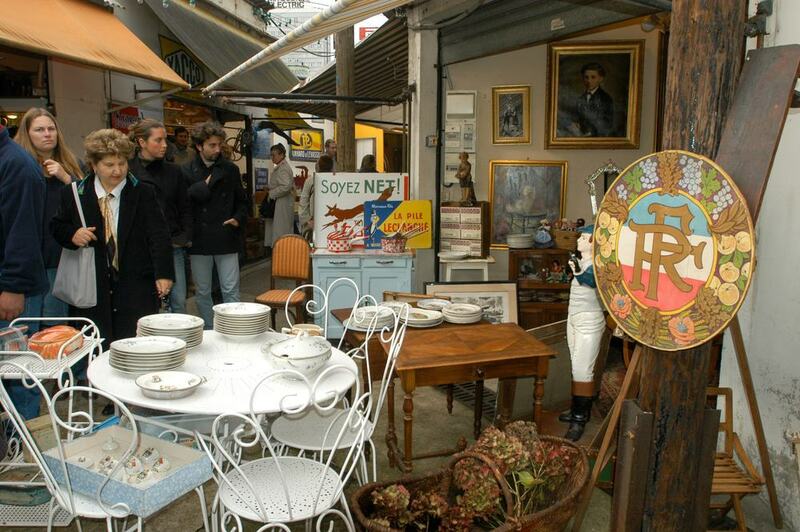 The Marché aux Puces de Saint-Ouen was born as an assortment of rag-and-bone dealers removed from the city, and its creation was linked to Eugène Poubelle making the dustbin compulsory in Paris in 1884. The market has permanent shops and stalls on indoor and outdoor streets, and is open Saturday to Monday. Each street has its own character and specialty, be it furniture, vintage cameras, toys, kitchenware and books. 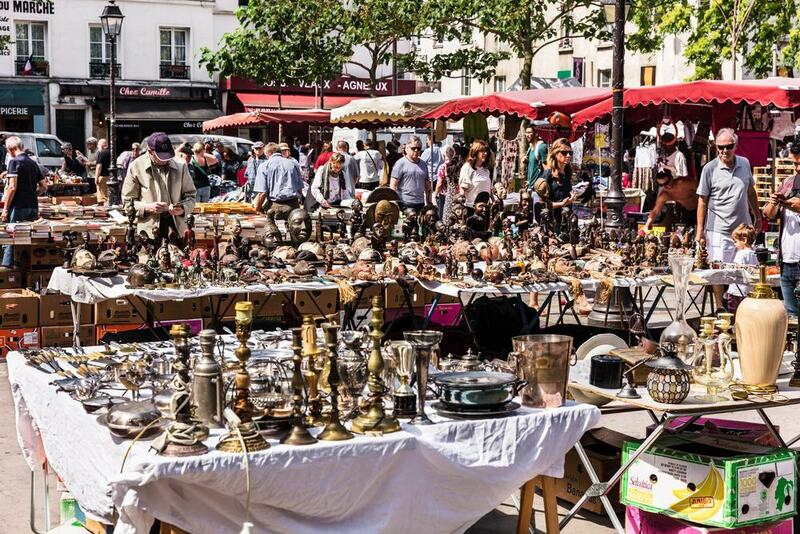 The most upmarket stalls are at the outdoor Marché Paul Bert Serpette frequented by the rich and famous hunting for antique jewellery, clothing and furniture. Climbing into Montmarte from Le Pigalle, with the dome of the Sacré-Cœur in sight, Rue des Martyrs is a slice of the earthy Paris of old. 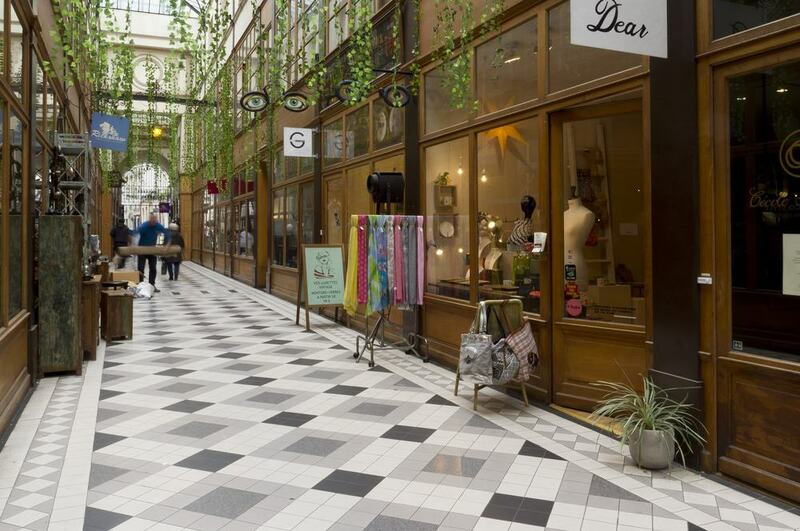 There are some 200 independent businesses on the street, from thriving cafes and bars to bookshops, antiques dealers, grocers, patisseries, specialty food shops and the live music venue Le Divan du Monde. The street got its name for supposedly being the place where Saint Denis, patron saint of Paris, was decapitated by the Romans in the 200s. Meanwhile its shops and the everyday people living on the street were the subject of an entire book by New York Times’ Paris correspondent Elaine Sciolino in 2016. 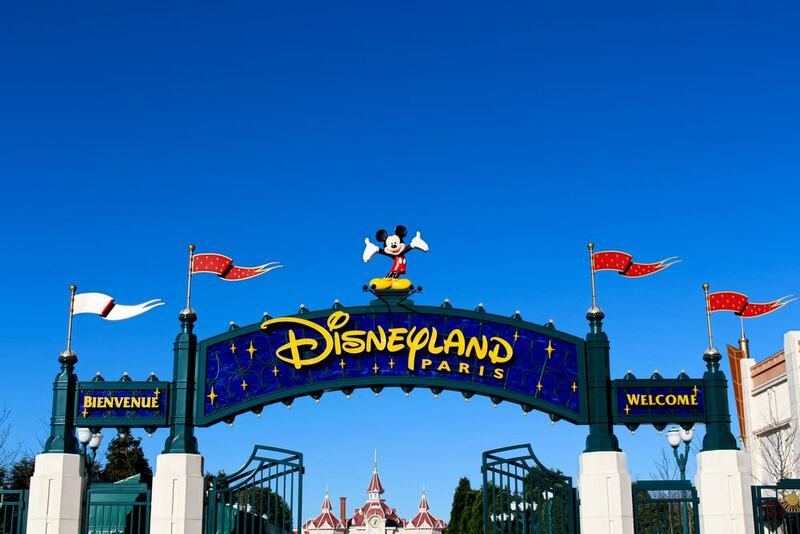 Disneyland is by far the furthest attraction on this list from the centre of Paris. But it’s doable if you catch the RER A from Nation, or even faster and a bit more expensive on the TGV from Charles de Gaulle Airport. For youngsters the whole thing will be a dream come true. At Disneyland Park they can meet Mickey and their favourite movie characters, and hit rides like Pirates of the Caribbean, Big Thunder Mountain and Space Mountain: Mission 2. Fantasyland and the Sleeping Beauty Castle have enough magic to bring a smile to jaded grown-ups. Older kids and adults could have even more fun at the Walt Disney Studios Park, a separate park about the moviemaking business, for stunt shows with high production values. Upriver from the Palais de Chaillot is another monumental project for the World Fair in 1937. In 2001 the west wing of the Palais de Tokyo became a space for contemporary art exhibitions, also staging talks, fashion shows, concerts, movie screenings and performance art. The stark, neutral design of the building makes it a kind of blank canvas for contemporary artists: Since 2012 it has added permanent “site-specific installations” by Laurent Derobert, Emmanuelle Lainé and Jean-Michel Alberola, among others. The Palais de Tokyo also has a bookshop, two gardens, two restaurants and lots of activities and workshops for kids.